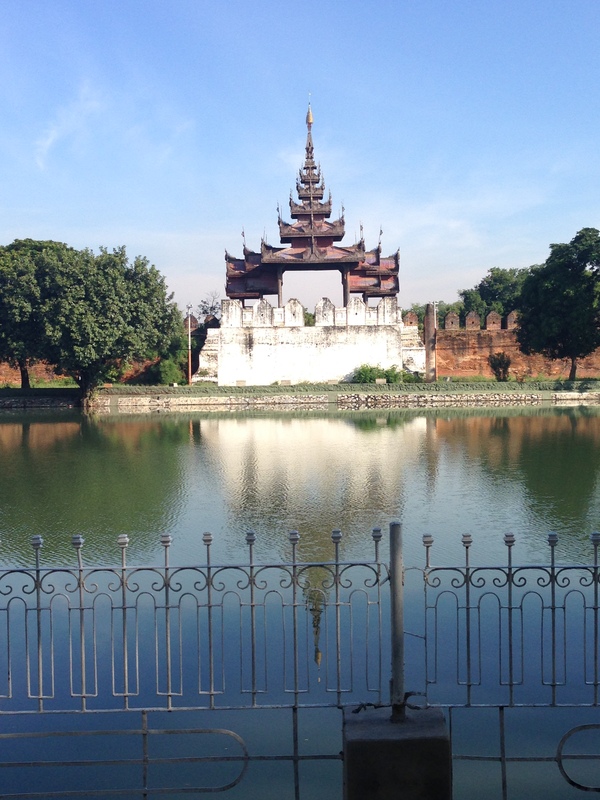 I came to Myanmar back in about 2007 on a work trip and I found the place totally charming. As soon as I got back home i told Jill that this place was fantastic and that it was just the sort of place that she would love. There is an intangible quality to the place that automatically rang the “Jill would love this” bell in my head. The thing about this place is that it is clean. The locals take pride in the place and it is spotless. The skies are the kind of clear crisp blue that we have not seen since leaving Australia, There is no smog, no filth just a pretty town ready to be explored. 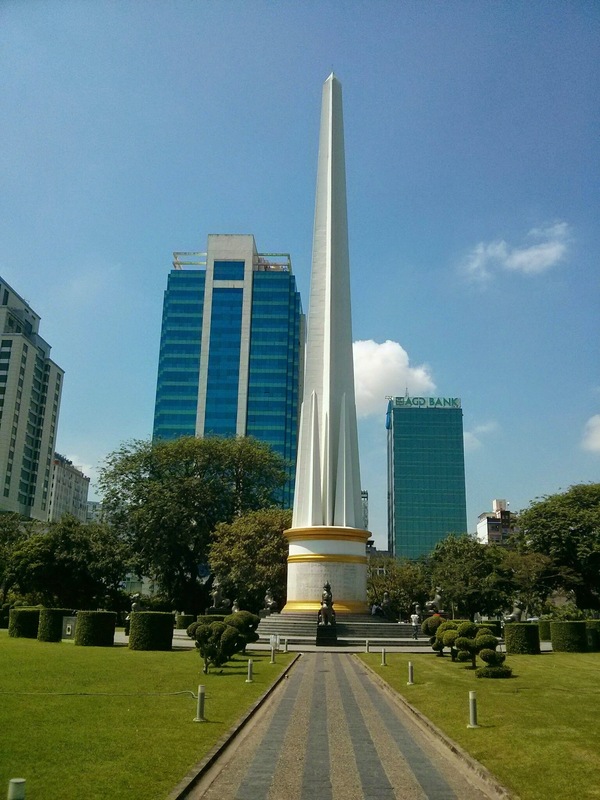 Myanmar has been under the control of a military regime since 1962 following a coup d’état. This military dictatorship officially ended in 2011. Throughout the military regime rule tourism has been virtually non existent but since 2011 the doors have been slowly creaking open. This all changed dramatically with the introduction of online e-visas. This officially came on line on 16 September and we applied on the 19th. So we are some of the first in under the new world order. 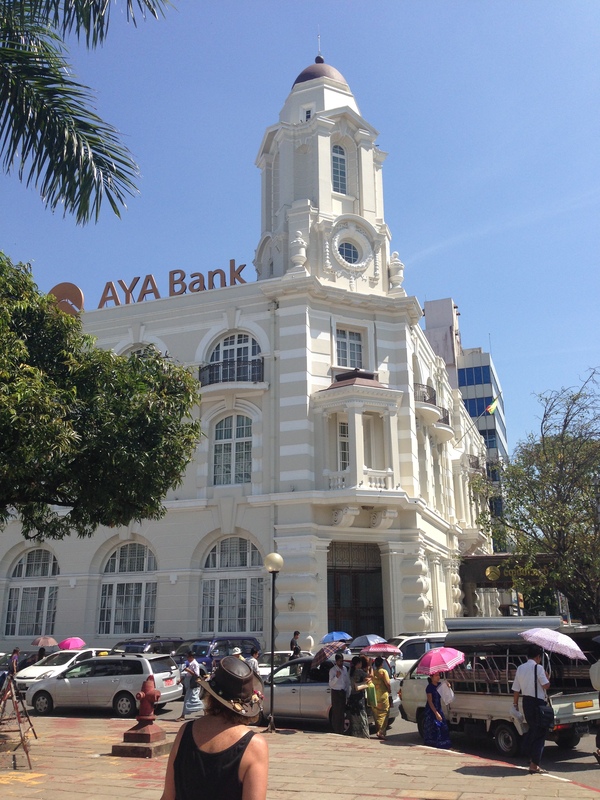 The change is obvious…banking facilities have gone from 2 ATM’s in Yangon to over 600 within a matter of months. The advertising on the TV is heavily geared toward the tourist…and towards the locals to encourage the tourist and greet them warmly. The travel challenges that once existed are almost gone. 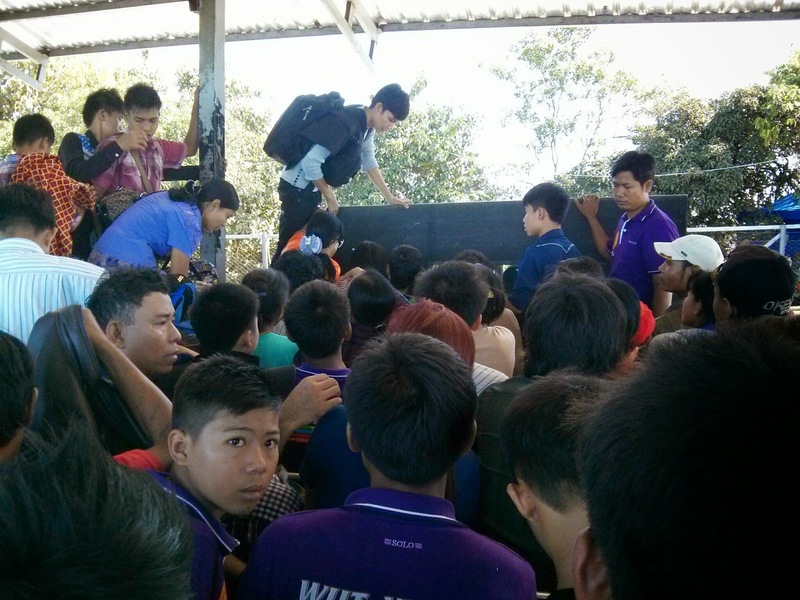 There is a heap of infrastructure work going on to improve things and wifi which was once non-existent and mobile phones which were impossible for foreigners to get are now all simple and commonplace. The first thing that I noticed on arrival was the introduction of chewing betel leaves and the constant spitting of this red goop all over the place. This was not a commonplace thing on my first trip 7-8 years ago…now it is everywhere..and it is disgusting. We checked into our hotel which was quite nice and hit the pavements as we tend to do on arrival in a new town. 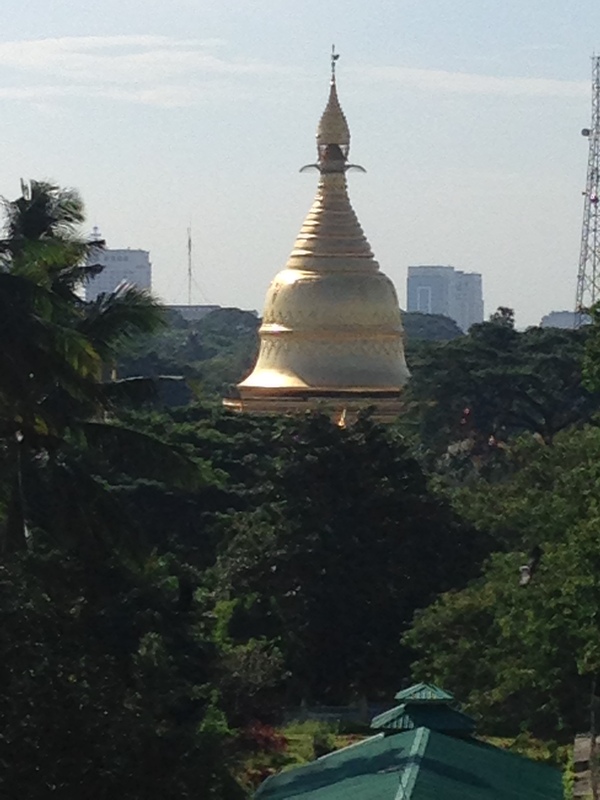 We headed up the main drag to town hall and the Sule Pagoda. Across the road we went…to the main park and cruised the main courthouse before deciding we were melting (mostly me) in the 32 degree heat and 89% humidity. We checked the long range weather and we basically have 32-34 degree days the whole time we are here and humidity is set to fluctuate between 83 and 89%…good thing we came in winter. We headed back to the hotel to hide from the heat of the day with a stop at a street stall by me for lunch. A plate of rice, two curries, some dried fish and an egg $1. We headed out that night for a walk along the strand. We have walked along many strands and esplanades so we had a preconceived idea of what to expect…we were wrong. Safe to say this will never make any of the guidebooks. We found a joint for dinner and walked back past the earlier attractions for a spectacular nighttime viewing of them all lit up. We crashed and were up early the next morning for the main attraction. 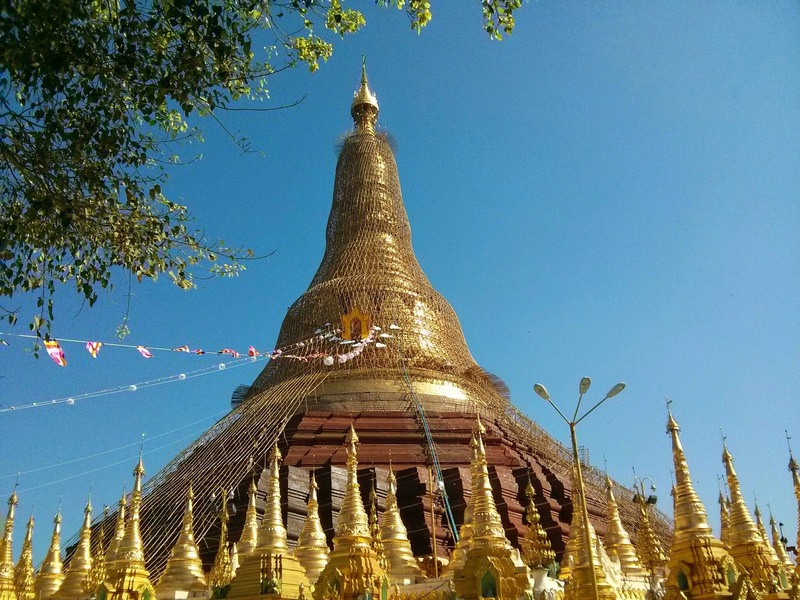 The Shwedagon Pagoda (officially named Shwedagon Zedi Daw) is a 99 metre tall pagoda and stupa, gilded in gold, standing atop Singuttara Hill in Yangon. 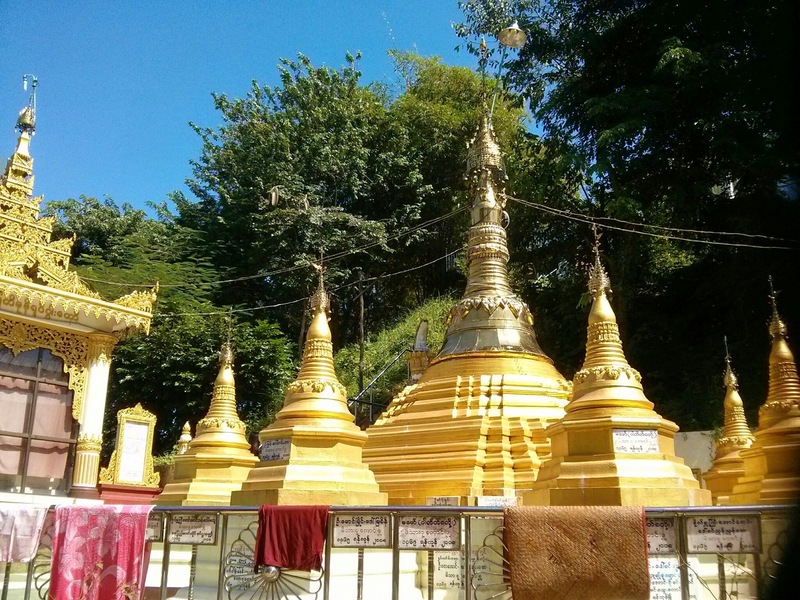 It is the most sacred Buddhist pagoda in Burma and wiki tells me that there are relics of four past Buddhas enshrined within. These are the staff of Kakusandha, the water filter of Koṇāgamana, a piece of the robe of Kassapa and eight strands of hair from Gautama. 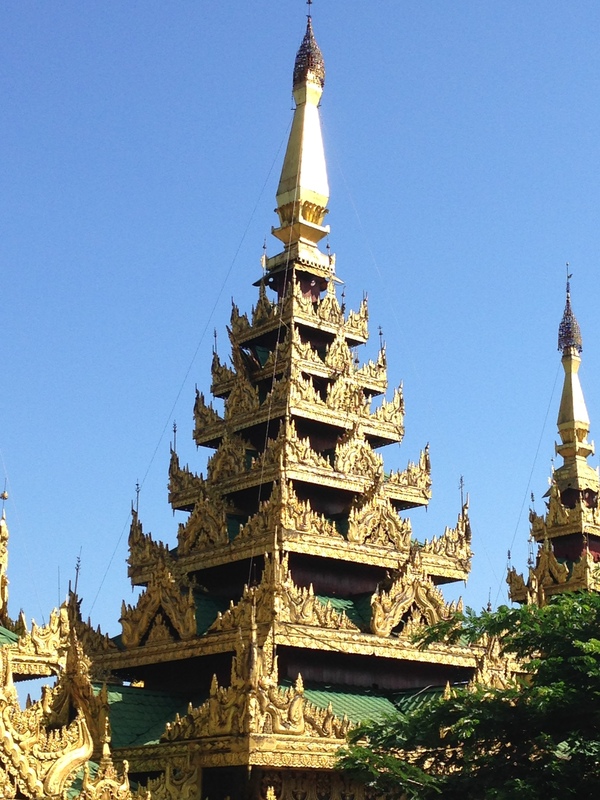 The craftsmanship of the many temples is superb – such detail, and so much gold, especially on the main pagoda (where the gold is real!) 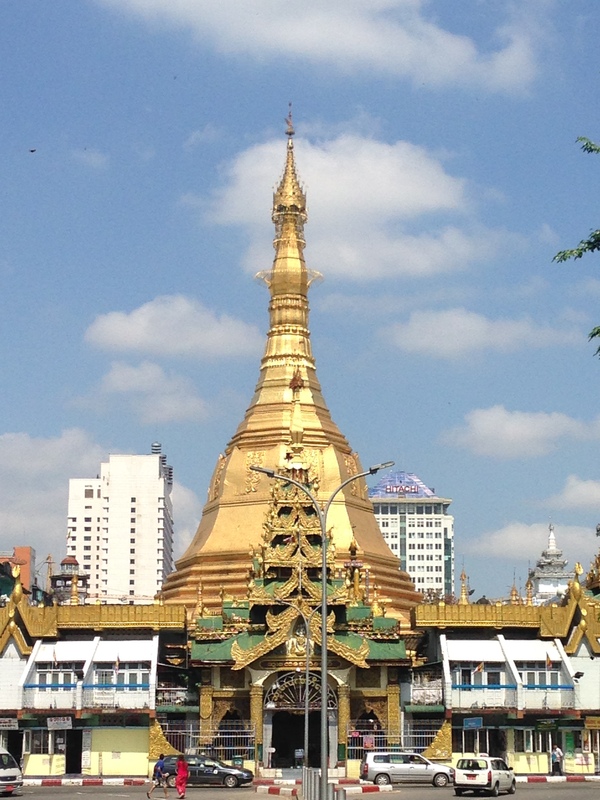 The main pagoda is currently surrounded with bamboo scaffolding as workers remove and replace the gold cladding. 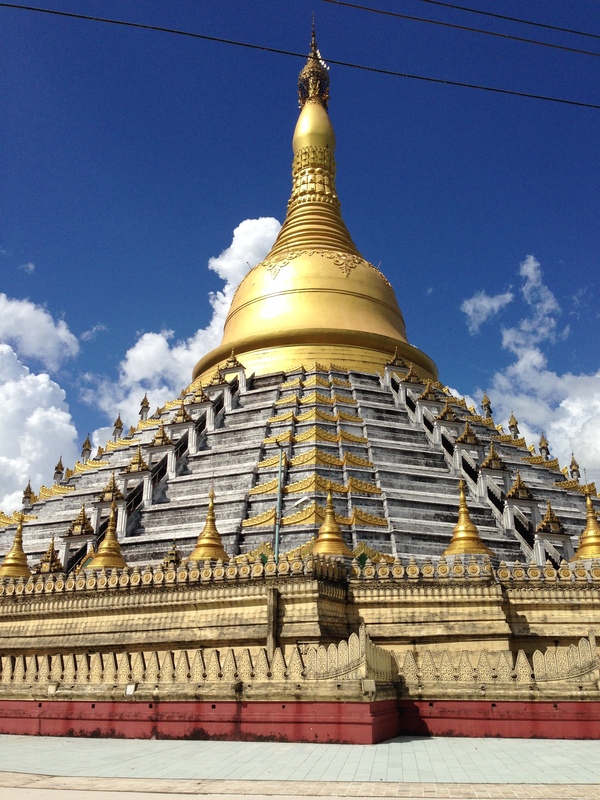 We spent our time hanging out at the top of the pagoda watching people praying, reading holy books, making offerings, pouring water over the Buddha (an act of merit) – all insights into how Buddhism works out in practice. This place was the highlight of my trip almost 8 years ago and visiting it again…I recall why. 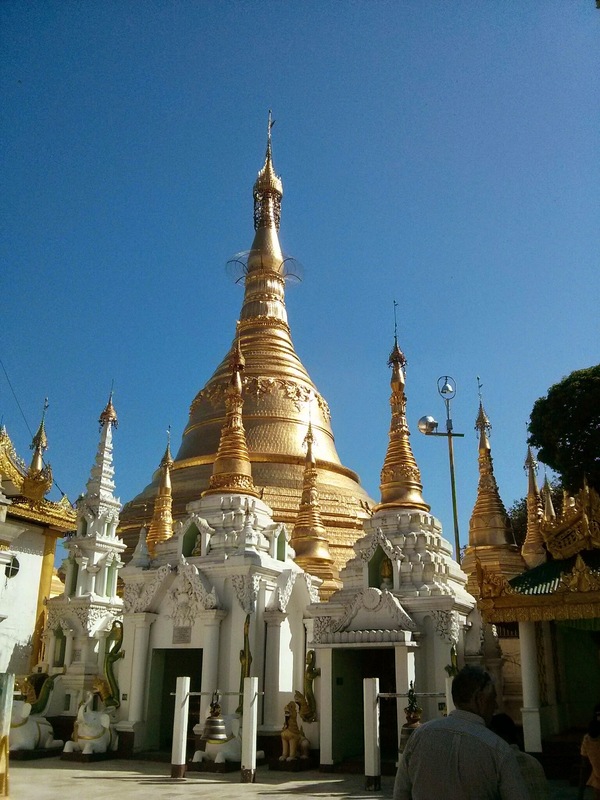 The Shwedagon Pagoda is a stunning sight and something you should add to a bucket list. 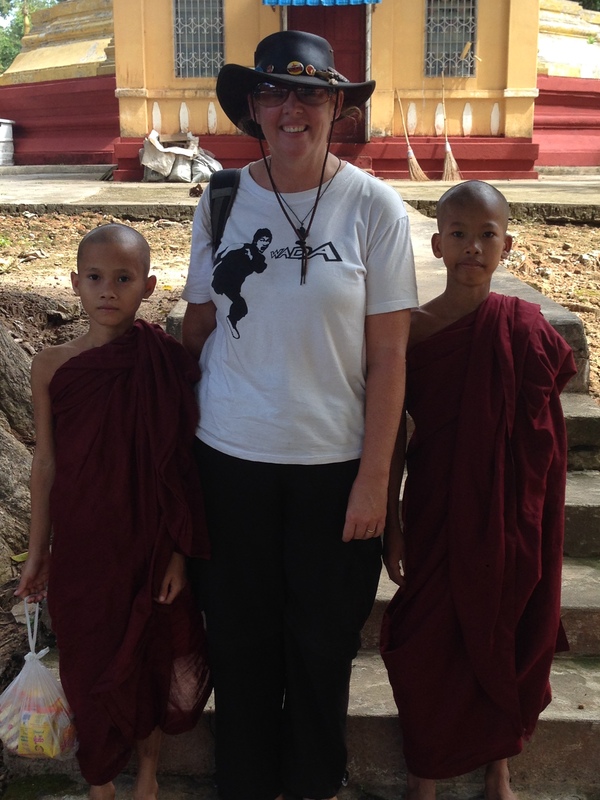 Oh by the way…I was right…Jill loves Myanmar. 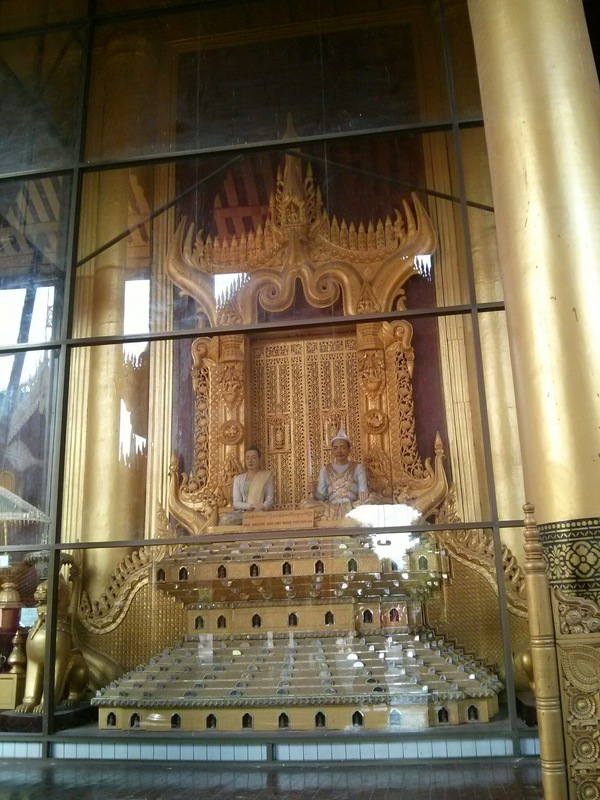 The one trick to know is that shorts above the knee and singlet tops are not allowed in any of the holy Buddhist sites. So you must cover up. My shorts were apparently too short so I had to buy and wear a lungi or longyi the local loop of cloth, skirt, sarong thing worn by everyone here. Well here we are three years on (almost to the day) from the original post (above) and we thought it was a good idea to come back to Myanmar. There were a few reasons behind this. 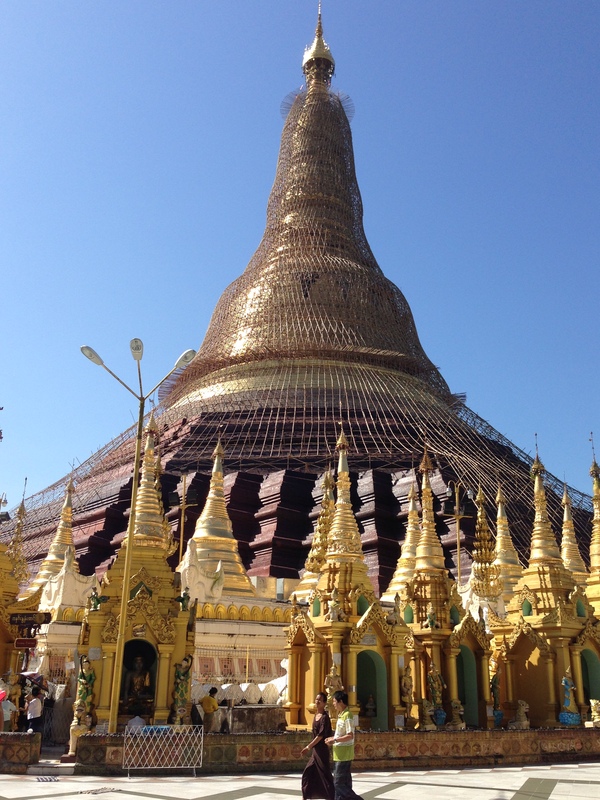 The primary one was that we loved the place so much another was that the Shwedagon Pagoda was covered in scaffolding at the time so our photos were just a little bit “less than”. Add o his a couple of very busy jobs and the time just seemed right. Our boutique little travel destination has started to become mainstream…it is nowhere near its neighbours (Thailand, Cambodia and Vietnam) but it is on its way. Encouragingly many of the things that we loved have endured. The traditional dress and the friendly demeanour remain firmly entrenched in the local ethos. 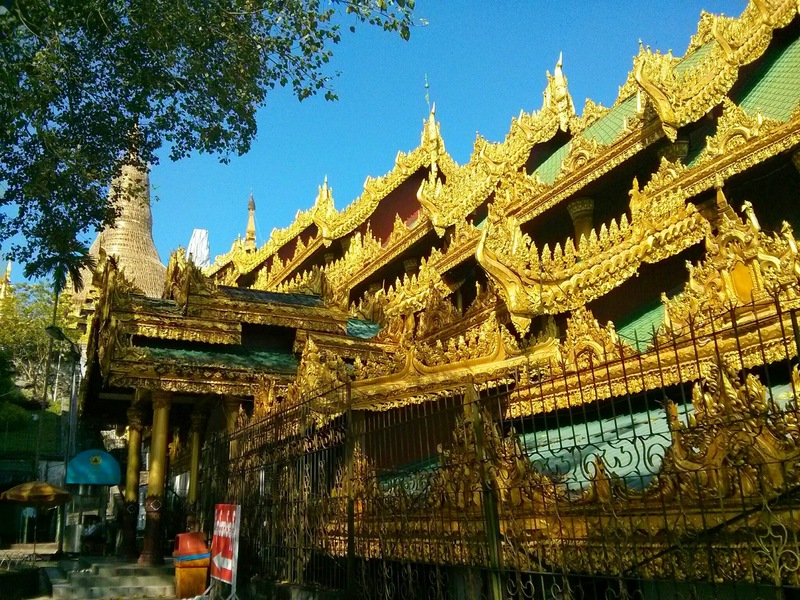 In a financial sense for travellers Myanmar has gotten cheaper. When we last came here the gates to foreign tourism had only been open for 3 weeks so the hotel prices were normalised with many places being a flat $50. Time and market pricing have set appropriate levels and the place that we paid $50 for last time was now only $30. We maintained our previous standard and the place maintained its standards, proximity to everything and friendliness. The hustle and bustle of Asia is just something that works for us. The total assault on your senses is just amazing. The sights, the sounds and the smells are simply incredible and we immediately feel at home. So the first thing we do is hit the street food stalls for a taste of the local culture. 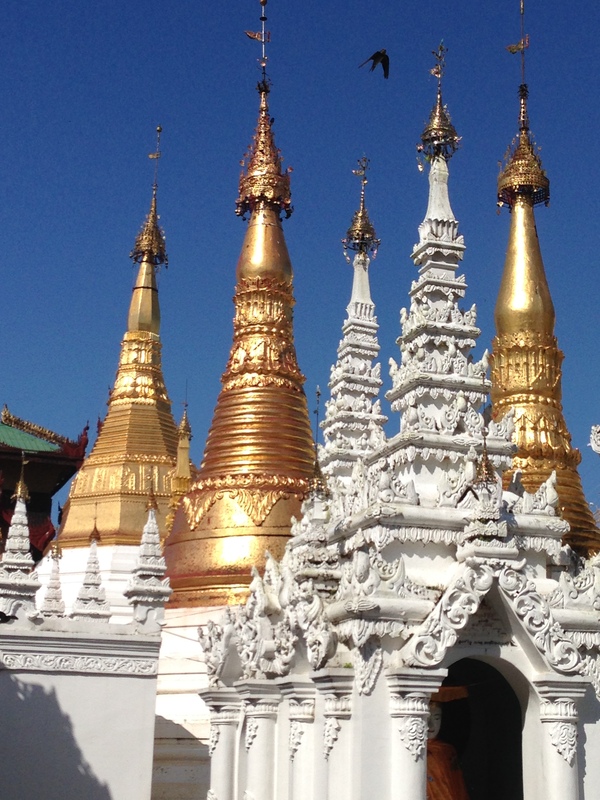 We used our trusty friend “Tripadvisor” to tell us what was both nearby and good. We found the place that we wanted and off we went. Alas, every now and then TripAdvisor gets it wrong. We headed to the 19th Street BBQ strip in the heart of China Town. Sadly the first thing that greeted us after we sat down was a small child with her hand out saying ‘hello money’. This pattern continued throughout the meal with a gang of about 5 children working the street while funnelling any proceeds to a rather obese woman who was clearly orchestrating the entire venture. This is something that would never have happened 3 years ago. The next was the food. To be fair it was tasty…but it was also obscenely overpriced and there was not a local face to be seen. You will pay on average 3 times the price for your meal here and probably not enjoy it very much. As a newcomer to Asia there is an element of excitement to it all but for any seasoned traveller…don’t bother. It was impressive a decade ago, as it was 3 years ago and it remains so today. It really is one of those things that you need to experience for yourself. I have been 3 times now and have been glad that I did each and every time. 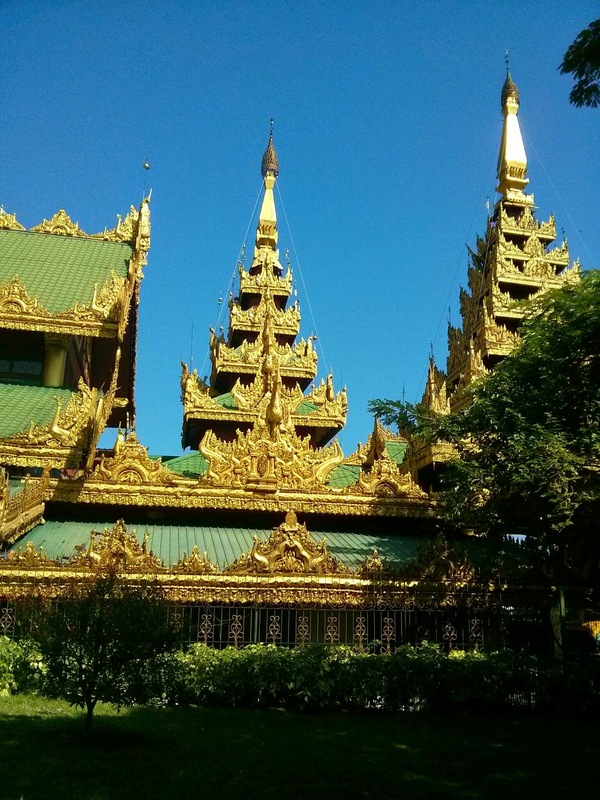 The rest of our trip in Yangon was just us doing our thing. We hit the small restaurants, the street food vendors the out of the way little holes in the wall. This may not do it for most people, but for us this is heaven. 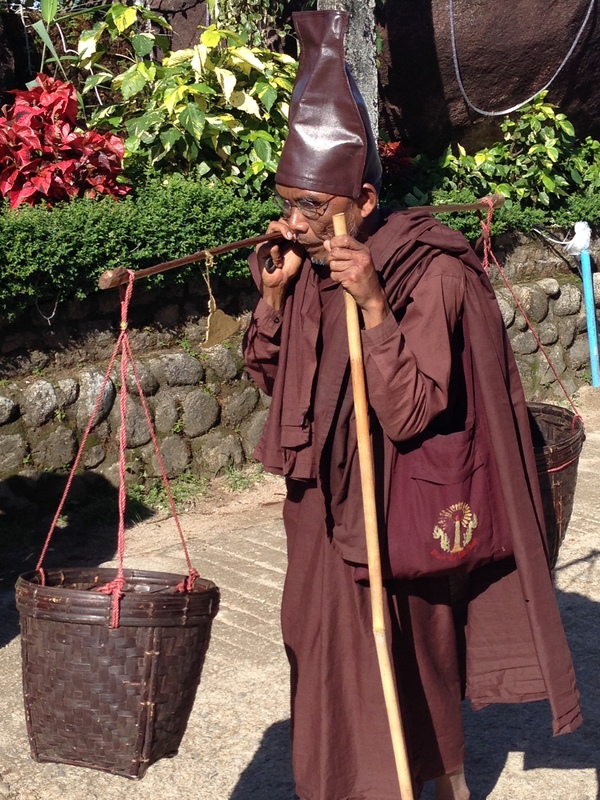 So we wandered, and we interacted with the locals in the most authentic ways that we could. Jill’s new found love of all things train, especially small gauge, came to the fore once again. 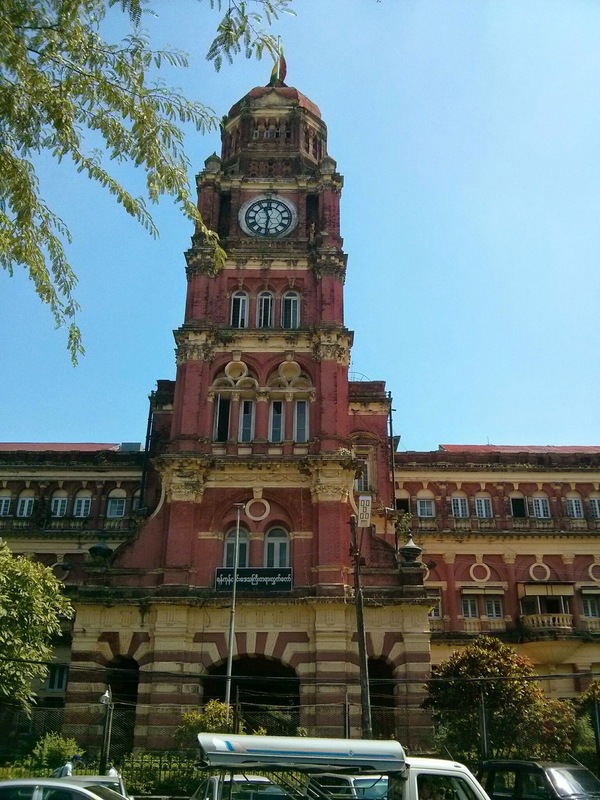 She booked us on a 17-18 hr train journey (which ended up being almost 20) from Yangon to Bagan. We have had some spectacular rail journeys in the last 12-13 months. The Maglev in Shanghai maxing at 431kph was great, the 24 hr journey to Tibet on the world’s highest railway was also good. The steam train through the Indian blue mountains to Ooty had character as the rack and pin cranked us up the mountains, as did the ones in Shimla and Darjeeling. 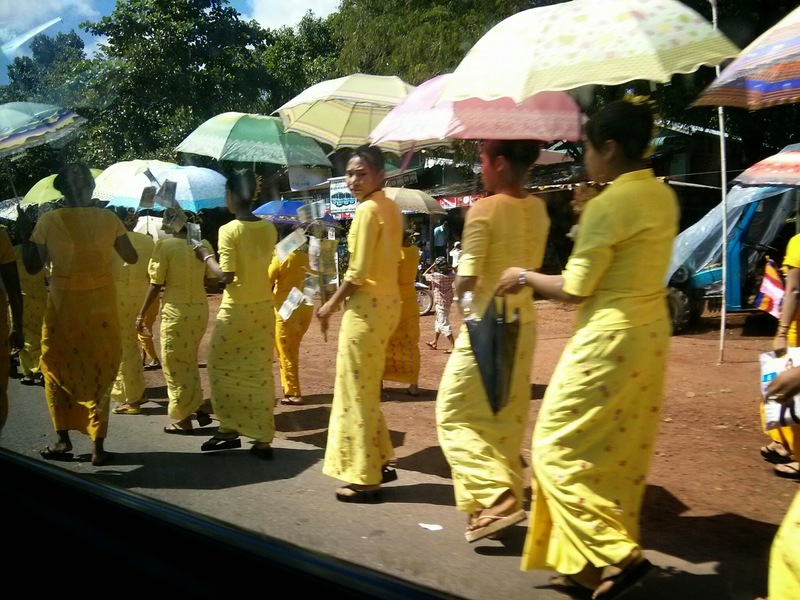 The beachside journey down the coastline of Sri Lanka was incredible…This one was not. The first thing that she mentioned was that they were prone to being a touch unreliable and could be running up to 12 hrs late. 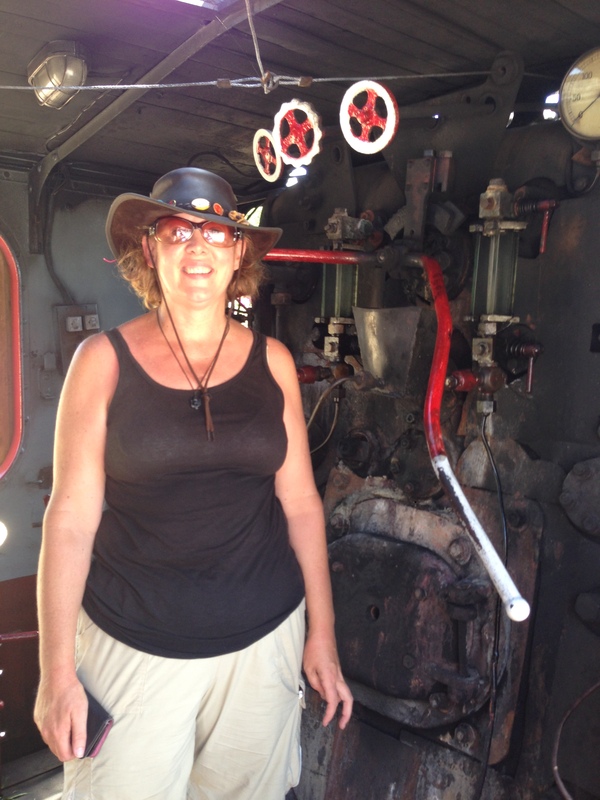 When we arrived we were met with a 1940’s model (about when the British left) insect and arachnid riddled train. We had the best seats in the house, which was the upper class sleeper…so god knows what the other classes were like. In its defence…it did leave dead on time. 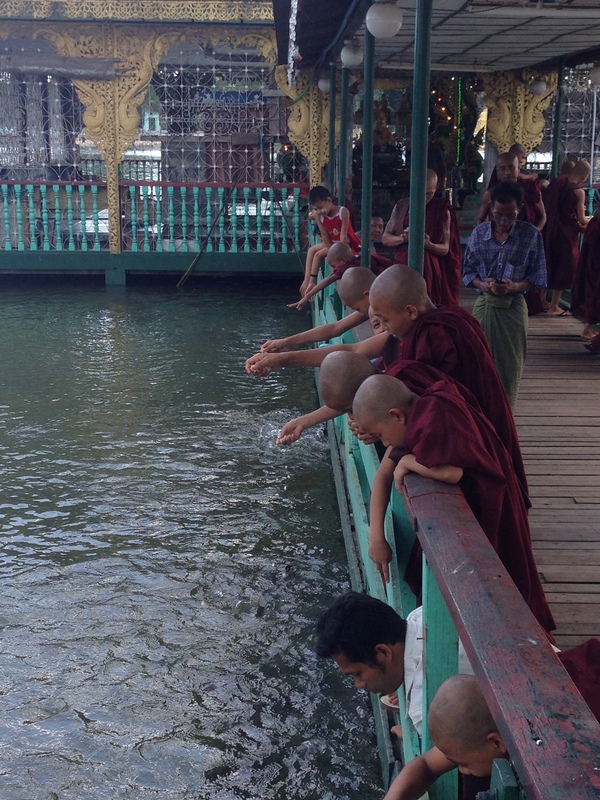 While tourism is quite new to Myanmar it doesn’t take long for people to find an angle and try it on. Before we left the station we had beggars, hawkers, bag carriers and the usual onslaught of people trying to take money from tourists in any way they can. Those on Facebook may have seen my post where we bought 10 beers for $7.10 of course on the train this was now $3 each…ridiculous…who would pay $3 for a 640ml beer (I think I may get a reality check when I get home). Anyway we set off…at half the speed of smell. At one point I shooed one of the many Mosquitos out the window of the moving train to get rid of it… Bugger me if the thing didn’t fly along next to us taunting me before accelerating and entering the window of the cabin 3 windows in front of us. The train had so much both vertical lateral movement that while seated on my bunk I became airborne, then flew across the cabin and nearly fell out of the window. Yes…I said vertical…somebody decided to build the railway track on sections of the local motocross tracks outside each city and town. The train hit big sections of speed bumps every 20 minutes or so…so much so that the impact all but caused renal failure as my kidneys decided they couldn’t take it any more and buggered off. Woo hoo…only 17 more hours to go… Fair is fair… Once you leave the city, the landscape is pretty. We are here in winter, just after the end of rainy season and everything is lush and green. And it is fascinating to see just how poor Myanmar is as a nation, as you quite literally pass grass huts…not just the roofs but the whole place, thatched walls and all. 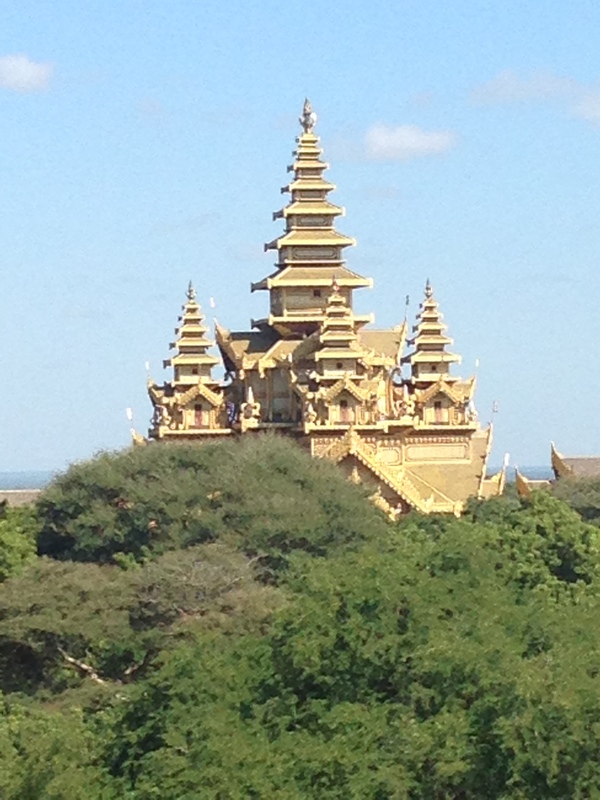 Add to this the corrugated iron mansions and you really do get a feel for just how poor a nation Myanmar is. Within 45 minutes of the sun setting (which was beautiful) the lights had attracted every bug within a 2 mile radius into our cabin. So we had a choice to make…keep the only semblance of breeze by having the windows open or be eaten alive by tiny critters. When a grasshopper the size of my forearm flew in we decided it was time to close the windows. Lathered in anti bug cream and a room fogged with bug spray we tried to sleep. At 2:30am we stopped and a local man, who could snore professionally, joined us and then left at a local stop at 6am. 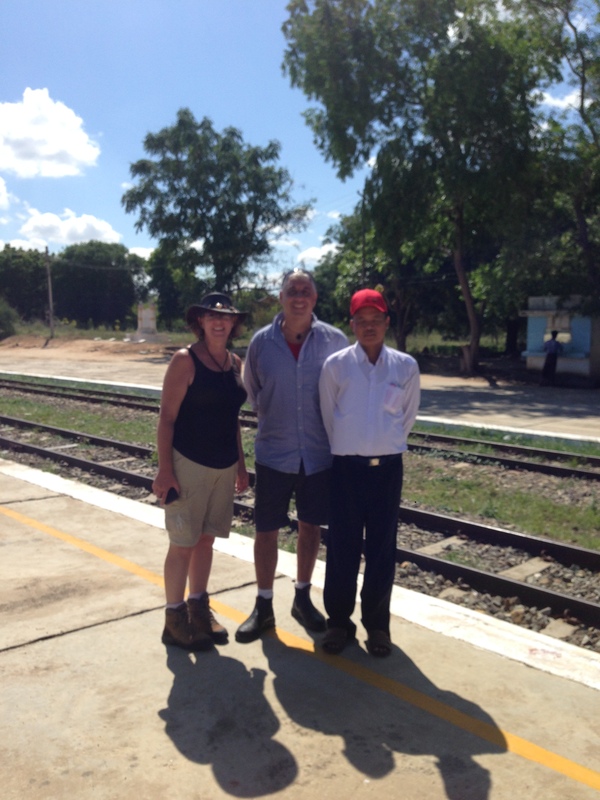 In a very quick chat before the train stopped…his first words to me were “thank you for visiting my country”. He was replaced by a man we found out was the regional superintendent of the railways. This meant that everyone on the train and every station we got to was kowtowing at every opportunity…so there was a constant stream of people arriving at our door or window saluting and ensuring that all was in order. Add to this the fact that each of them brought food or drinks for the boss. Needless to say our morning coffee (Nescafé 3 in 1) was all of a sudden free. In a chat the railway king told us that they would be opening a steam train leg that day for tourists…from Bagan for a 3 hr sunrise and sunset journey. 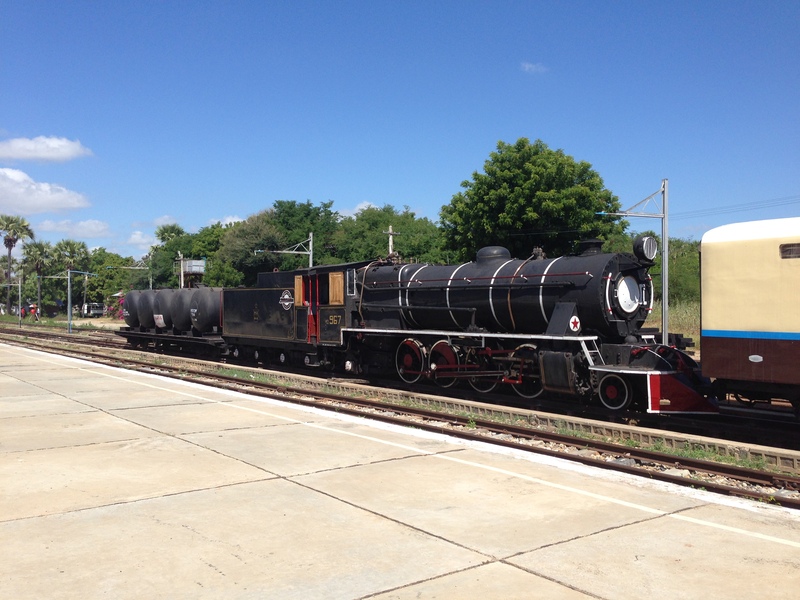 He arranged for a personal viewing of the train and photograph session. He commented that he had been to Seoul in South Korea and that their trains were very different…we agreed. He mentioned how smooth the Korean trains were and said that his were more like riding a horse. When he found out where we were staying he offered to help with organising and negotiating our taxi etc. It was 37 degrees when we arrived but felt hotter due to the humidity…did I mention it was winter. I remain conflicted… I can neither recommend nor dissuade such a journey. Having got off our nightmare 20 hr train journey to get here we were greeted with 37 degree heat and the usual Burmese 80+% humidity. We hopped our cab to get us to the accommodation. Now when I say cab…we sat in the back of a ute on a thin mattress and bounced around until arriving at our booked place. Our booked hotel was pretty good… considering. It was $25 a night for both of us which included breakfast of eggs, toast, fruit, pancake and coffee. The TV had a total of 4 channels none of which were in English and despite advertising wifi… We could not get any internet for the entire time we were here. That was not just the hotel but also included every cafe, coffee shop and restaurant along the entire main drag. 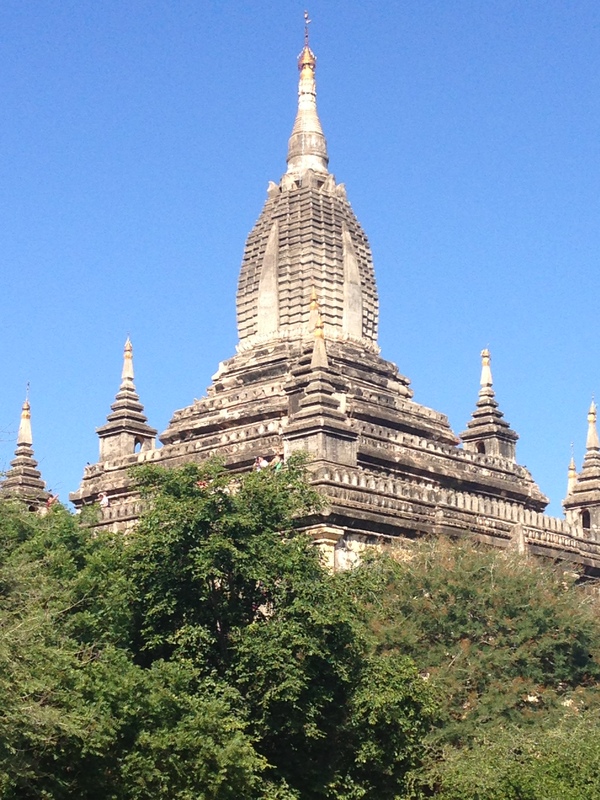 Between 1044 and 1287, Bagan was the capital as well as the political, economic and cultural nerve center of the Pagan Empire. 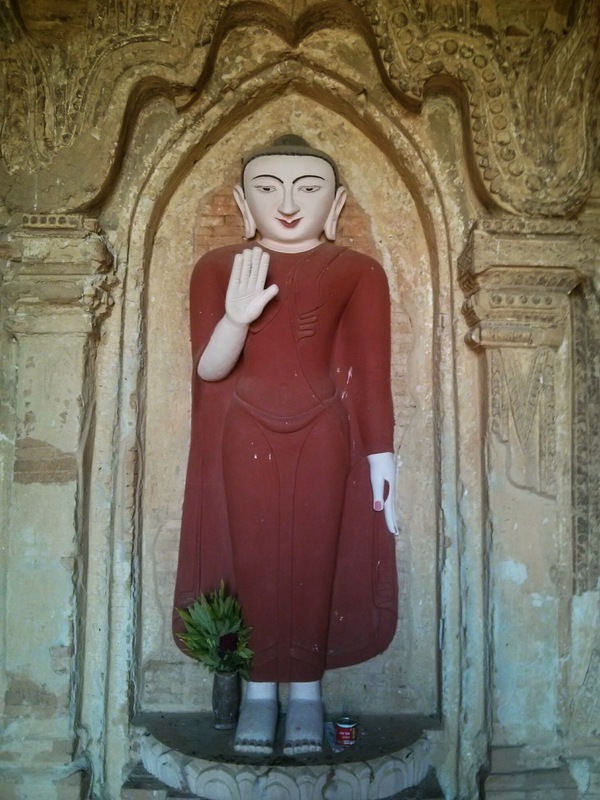 Over the 250 years, Bagan’s rulers and the wealthy citizens constructed over 10,000 religious monuments (approximately 1000 stupas, 10,000 small temples and 3000 monasteries) in an area of 104km2 in the plains. 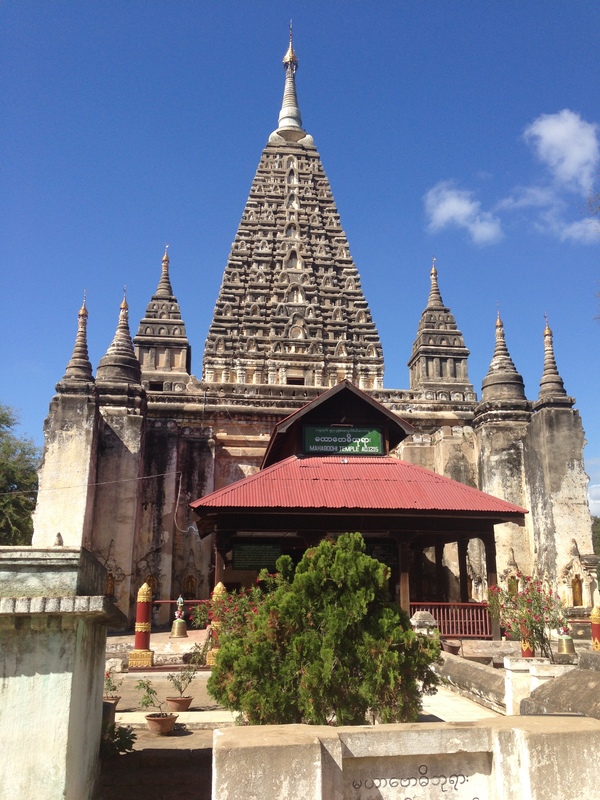 About half of these remain today and so Bagan is today home to the largest and densest concentration of Buddhist temples, pagodas, stupas and ruins in the world. Jill read in her planning books that the best way of getting around to the sights was on a horse and cart…so this was in her head as the way we must travel. 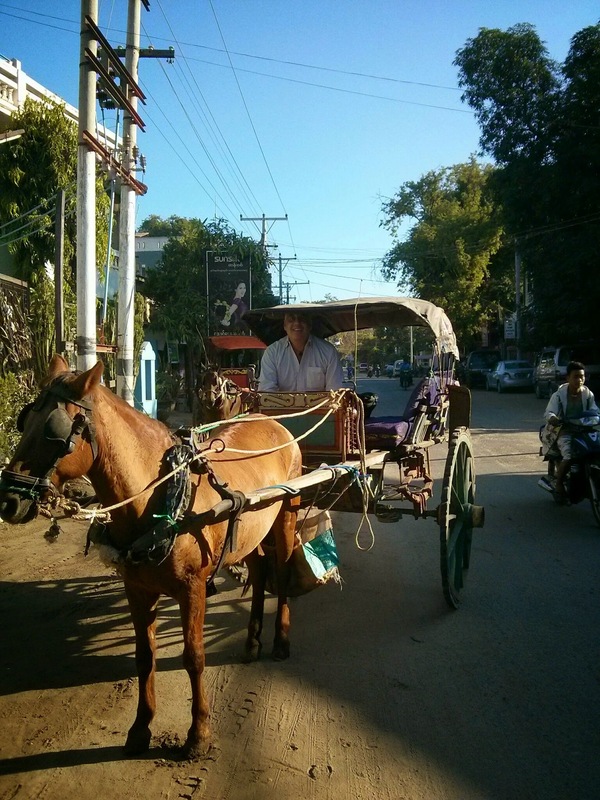 Totally ignoring the motorbike hires, the air conditioned cars…nope…horse and cart it was. 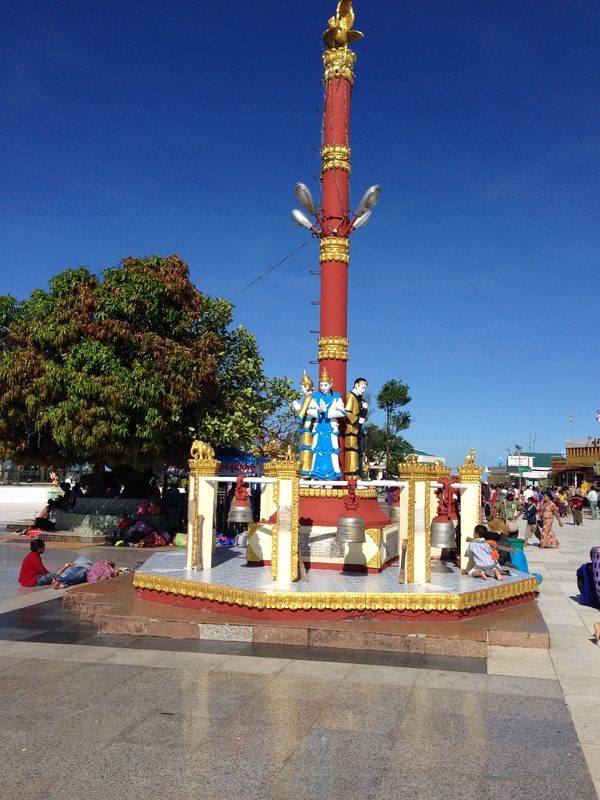 Fair is fair, it was a great way to get around to all the ruins, temples, pagodas and stupas. A car would have been annoying as the distances between each was quite short and the air conditioning would have no time to kick in, the busses were just packed and wrong, and motorbikes and bicycles would be in high heat on sandy tracks. 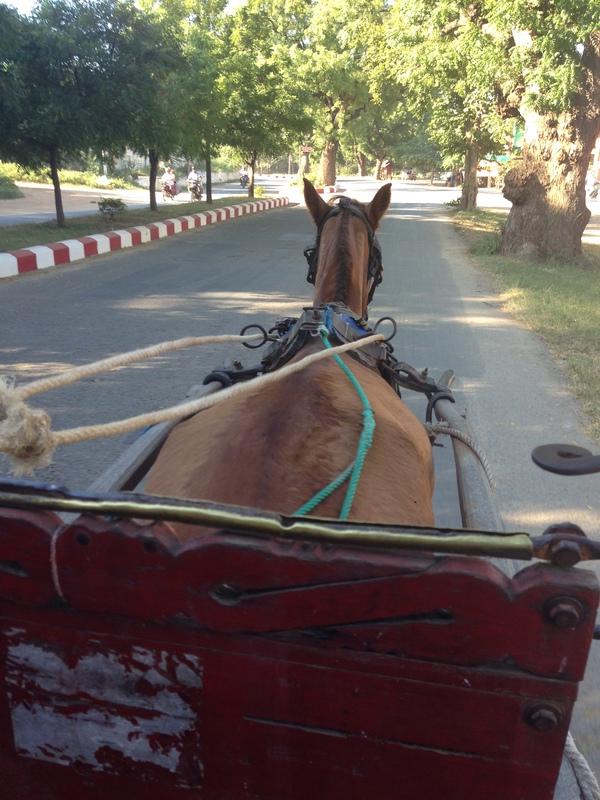 The horse cart gave us a breezy, shady ride with minimal exertion and views 100% of the way. This was a great day. It was another of those days where our photograph count went through the roof as we snapped away at each of the relics. Each one is individual and unique in its own right, add to this the extreme detail on each one and then add the fact that each angle opens up new views and aspects. There is nothing you can do but to snap away and try (and fail) to capture some sense of just how good this place is. 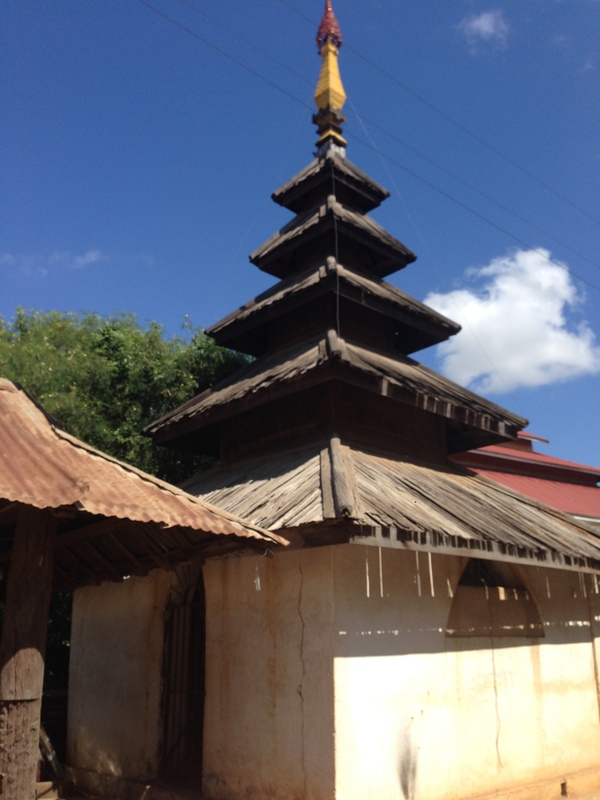 Once you have snapped away at the ground level temples etc you hit a few that you can climb up. 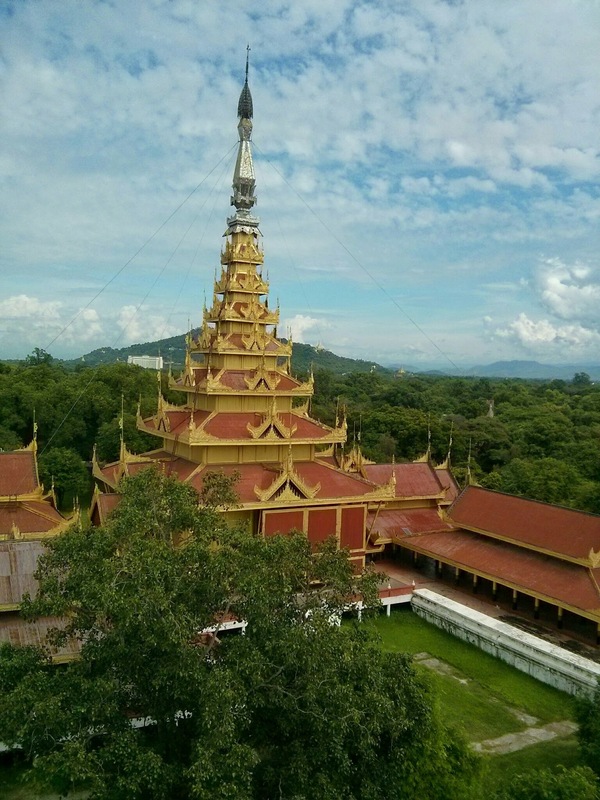 From these high vantage points atop the pagodas you get a sense of just how vast the Bagan plains are. 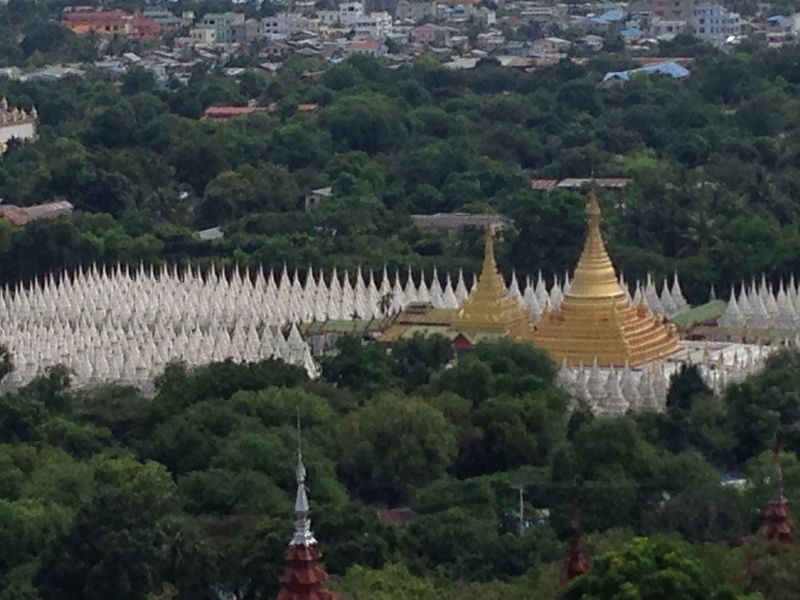 You basically have 360 degree views of the whole place and in every direction all you see is trees and temples. We tried to do some panorama style shots to give you guys a sense of what it was that we were experiencing. Once again they will not do it justice but hey…it’s what we’ve got. As we were here just after rainy season the place was lush and green, making the contrast between the red bricks of the pagodas, or the white or gold of the stupas really stand out against the green of the foliage. The area is quite hot and dry so I imagine that it could be brown at other times of the year making the contrast less defined. Either way, we had an incredible day cruising around the relics. We have been to several of these sorts of things so far and still have a few to go. It will be an interesting recap and comparison of these ancient sites once this leg of the journey is over. So far on this trip we have been to Hampi in India, Bagan in Myanmar, Polonnaruwa in Sri Lanka and we are yet to do but are heading off to Siem Reap in Cambodia and Luang Prabang in Laos. While the funds will not allow it on this trip, and we will have to go home and be adults for a while…we have the intention of saving our pennies and doing a similar journey to South America which will hopefully add a bunch of ancient Incan cities and ruins to further add to our comparisons. So again here we are three years after our last post and I thought that I would just follow on from the previous post and give a sense of what has changed and my thoughts on the place as it stands. 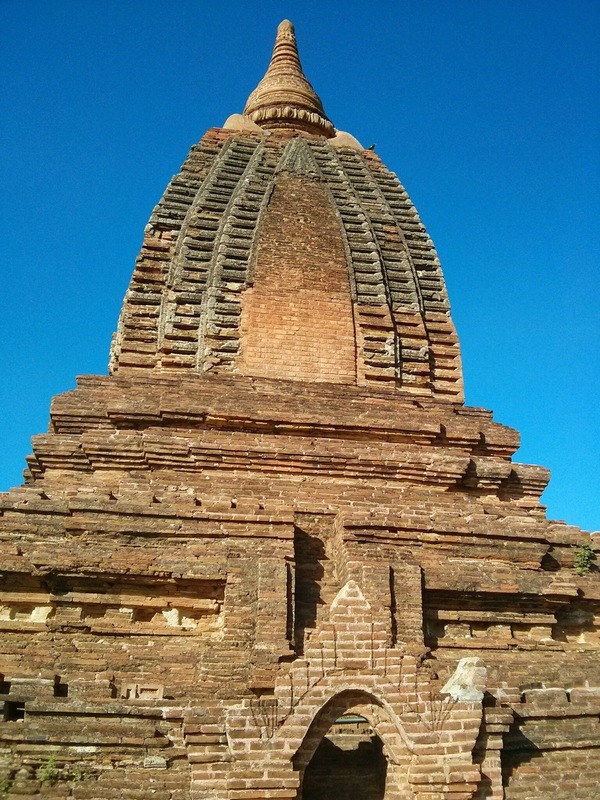 On a positive note…Bagan still rocks…the temples, the weather, the people and the prices. Everything about this place screams as a fantastic destination. Once again the tourist numbers were way up on last time but the hotel prices were also well down. We moved ourselves to a new hotel that was much closer to the restaurant strip and we are so glad that we did. The last place had crappy wifi and was quite the trek from any restaurant worth eating at. This time we were in the heart of it all in a hotel with a little less crappy wifi. The biggest change that you notice is the abundance of e-bikes…these things were not here the last time and they are a blessing. 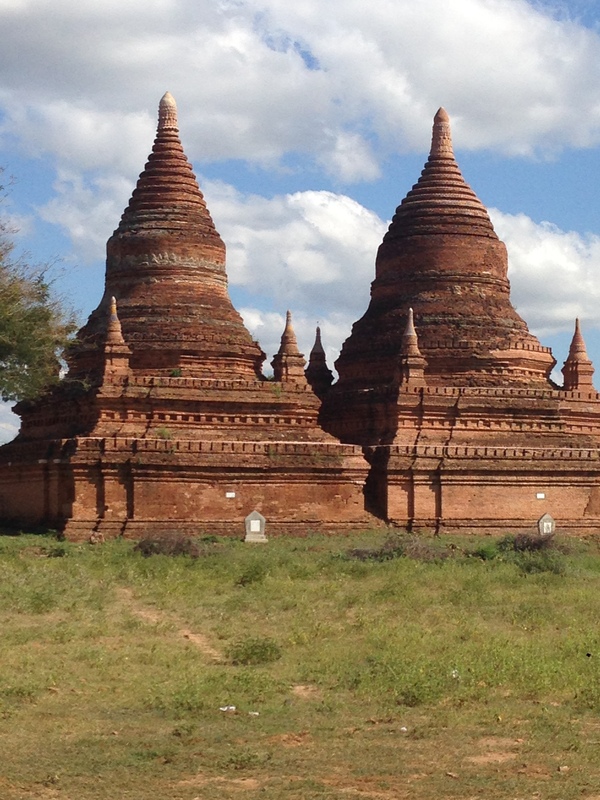 For between $5-7 a day you can hire these whispering assassins and explore the temples of Bagan at your own pace and leisure. To be honest, on your first day of exploring the temples I would still recommend doing the horse cart…it is just one of those things that you will talk about for years to come. 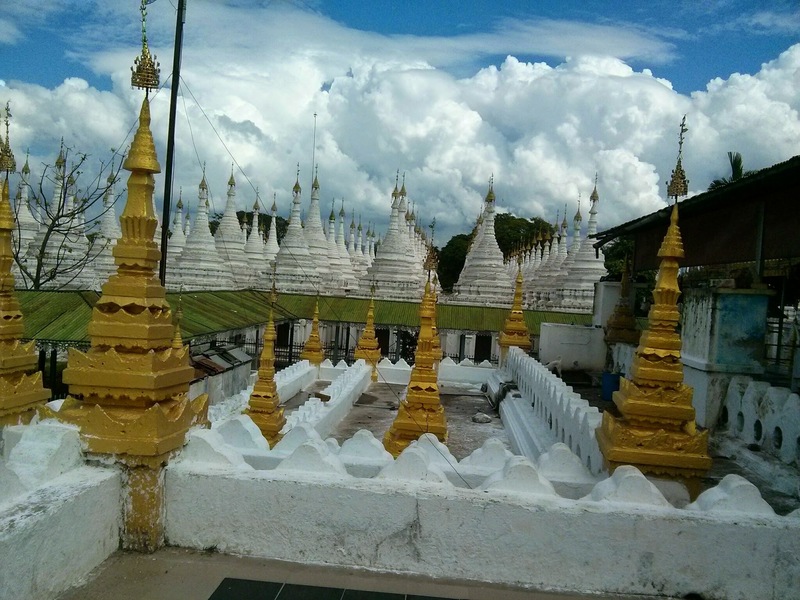 So on day one we hit the usual trail and snapped about 3000 photos of temples, stupas and pagodas. And it was fantastic (again). The first trip we bought a couple of the sand paintings but as it was towards the end of our BIG adventure we were a little cash poor and were certainly luggage challenged. This trip however we were cashed up and had plenty of room for souvenirs (that said we only bought 2). So on day one we checked out what was on offer and the sorts of prices that you could expect to pay. This is possibly the biggest tip of all for travellers and will be obvious to most…but never buy on the first day. By day 2 or 3 you have walked away from so many touts and have heard how low the prices can go and therefore are more likely to grab a bargain. We were wandering the temples on day 2 and heard some Americans bartering to pay between $18 and $20 for the same pair of pants we had been offered the day before for $5. So day one was the usual suspect temples and the local cuisine and of course for those of you who have been following along…those damn stairs. So day one done and the photos taken it is off to the local restaurants. Now while we ate Asian with a smattering of Burmese last time we did not really immerse ourselves into the local fare. Something that we absolutely did this time around. Jill found and incredible little lunch joint for the next day called Myo Myo. It was a lonely planet special recommendation and involved about 30 tiny local dishes that you grazed upon as it suited you and you only pay for what you eat. This was lunch time of day two and the pair of us ate like champions and had change from $10. But the dinners were equally as tasty but were a tad more expensive as they were washed down with icy (and I do mean icy) cold beverages. So day one over and we hopped on the e-bikes and off we went exploring at our own pace. We saw it all. Days two, three and four allowed us all the time in the world to check out anything that we wanted. We spent an entire day when we went off the reservation and found ourselves in random, out of the way villages. We found ourselves amid a cattle drive, and 30 minutes later were surrounded by goats. We were in the villages where all of the lacquer-ware was actually made. While commuting we came across a little market garden come restaurant. It was lunch time so we stopped. We ordered some local Burmese salads, a bean salad, vegetable salad, tea leaf salad and a tomato salad…and we were blown away by them all. As we were the only ones there…a conversation ensued. As this was so far off the beaten track very few tourists happened upon the place and even fewer ate the local fare. So we asked about what made the food so nice…long story short…we came back the next day (quite the effort finding it again) and had a private cooking class with his wife in their dirt floor kitchen in the middle of nowhere. The number one thing on the menu that I wanted to learn to make was the local boiled egg curry…and of course work out what was in those damn salads to make them so good. So back we came…everything that we needed was in the garden or in a small collection of powders and sauces. And off we went…the truest and most authentic experience you could ever have. He spoke very little English and she even less. The ingredient interpretations took some doing but we got there and after about an hour we had a feast on our hands. We ate, we washed it down with cold beers and when we tried to pay the comment was that it was their gift to us…now obviously that was not going to cut it…so we guessed at how much it would have cost for the food and drink and multiplied it by 4 and paid that. We thanked them for their time and their hospitality and for the sharing their knowledge with some interested travellers. And on the way out we happened across a local wedding…The bride and groom sitting atop an elaborately adorned oxen cart…so we snapped away. 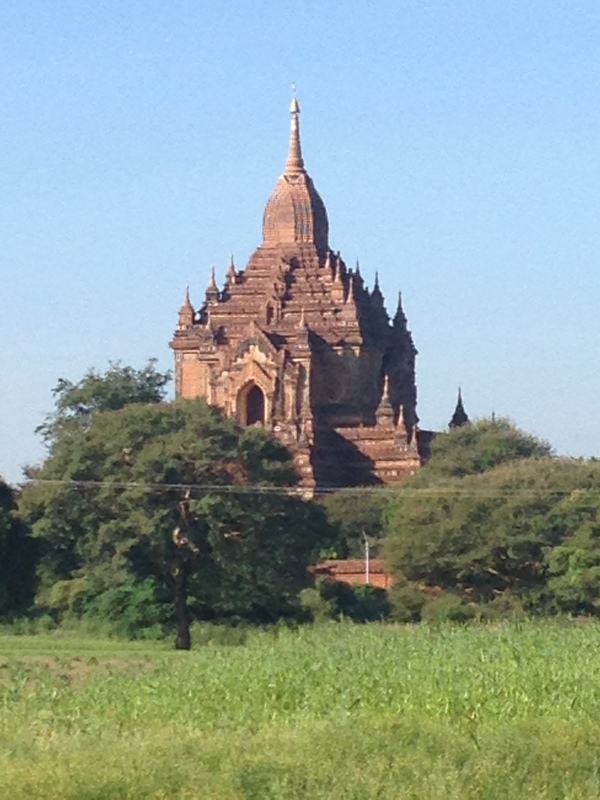 So the verdict is that Bagan is fantastic and a must see for all. We have been twice now and it has not disappointed either time. Put this one on your bucket list. A short flight from Bagan to Mandalay and we were off on our next leg. Tiny airports really do add a whole new level of interest to a journey. We were on a baby prop plane that required the weighing of everything that went onto the plane. We were originally booked Air Bagan but were changed to Asian Wings airline…but still had to check in at Air Bagan. There was no assigned seating…just first on, first seated. Despite all of this it was a relatively uneventful flight. 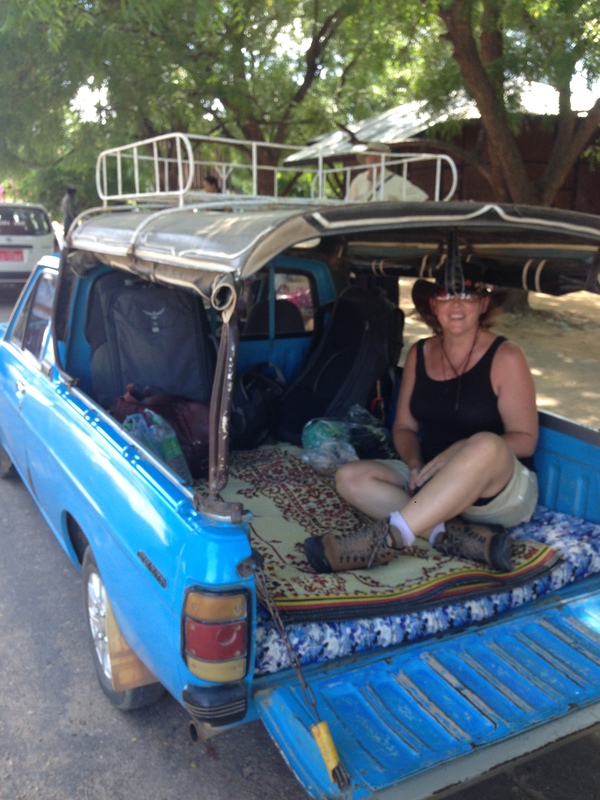 We arrived and ended up in a share taxi to town… And on to our accommodation which was really nice…and our taxi resembled a passenger vehicle…no ute taxi this time. 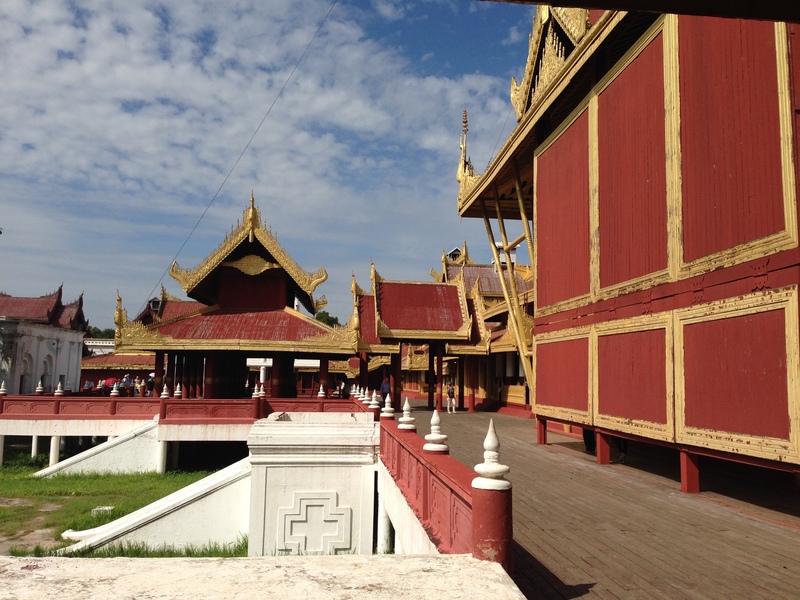 Mandalay is the second-largest city and was the last city used as the royal capital. 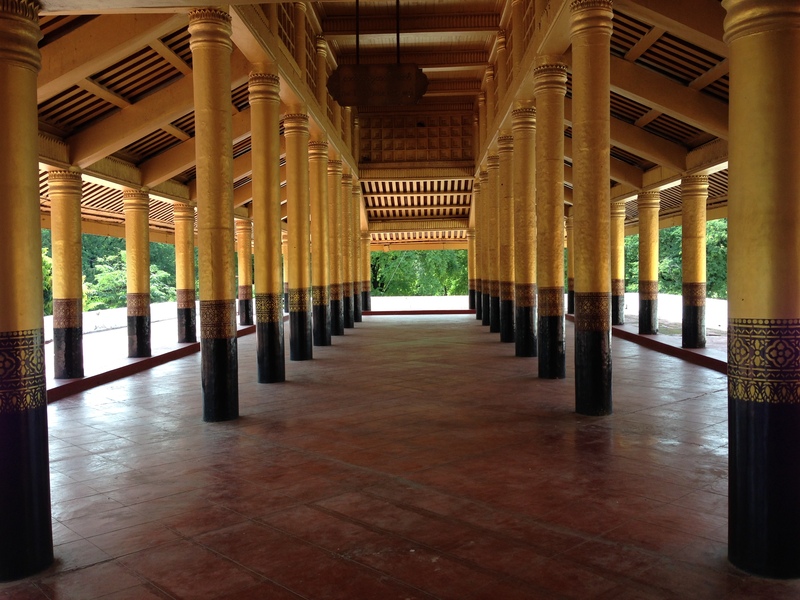 The palace was originally the former royal palace of Amarapura which they dismantled and moved here by elephants. The palace is at the centre of a 1020-acre citadel surrounded by four 2,032 m long walls and a moat 64m wide, 4.6m deep (thanks wiki). The walls originally had three gates on each side, and five bridges to cross the moat…at present there is one bridge per side. 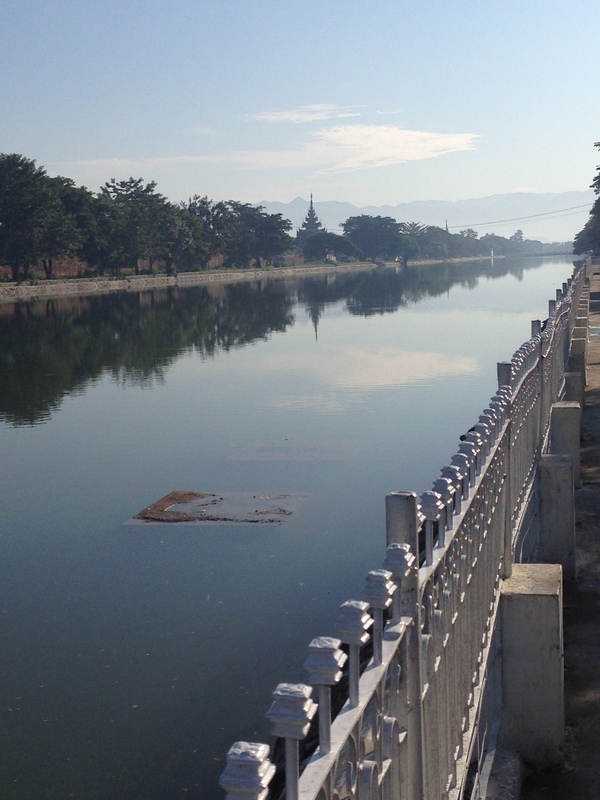 We were staying about 2km South-west of the palace so decided on an early start to avoid the heat of the day. 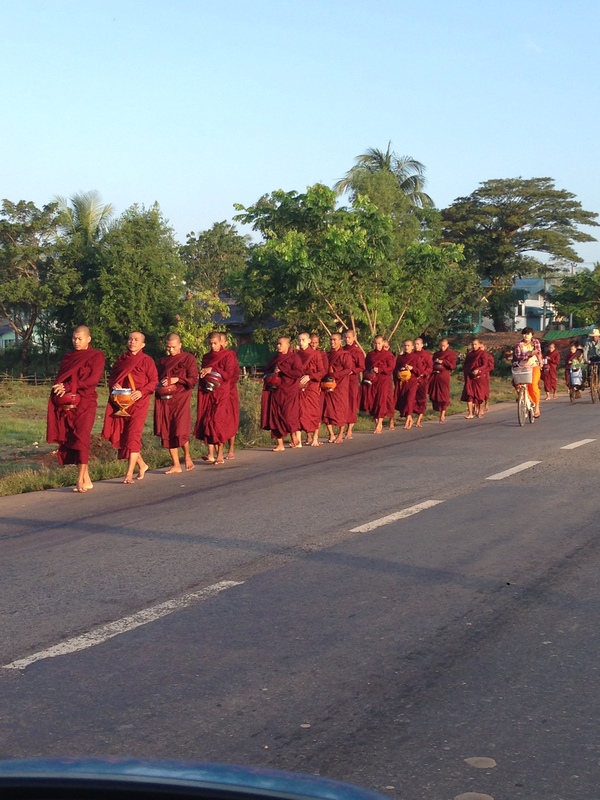 We walked the 2k to the corner, then the other 1k to the bridge…only to find the south gate was closed to foreigners. 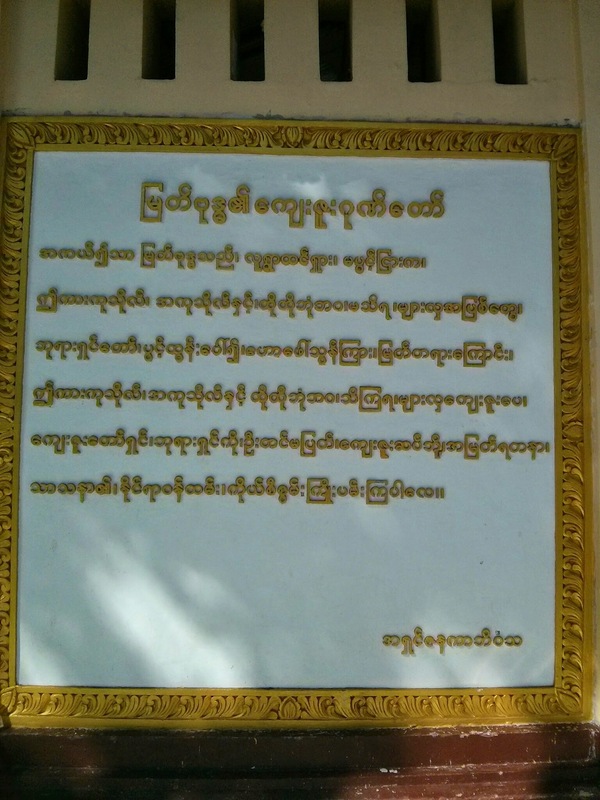 So we walked the 2k to the east gate, to find that they no longer accepted US$ but only the local kyat. So we walked one K to a big hotel, changed our money and walked the one k back to the gate. Having paid we walked another k to the palace where we poked around for a while. 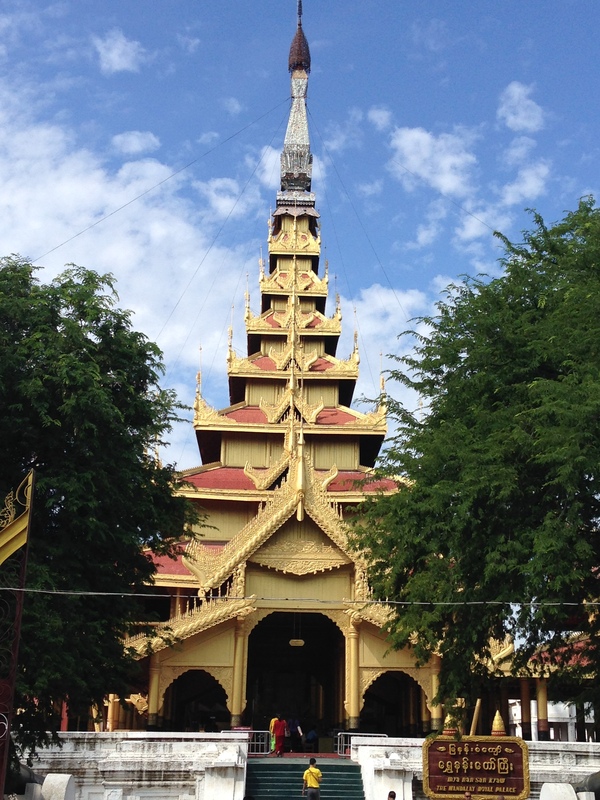 Buddhism reigns supreme here and about 15km out of town in Amarapura Township is the Mandalay Swedaw pagoda celebrating the tooth of Buddha. Not the actual tooth because we saw that in Kandi, Sri Lanka…but a replica. 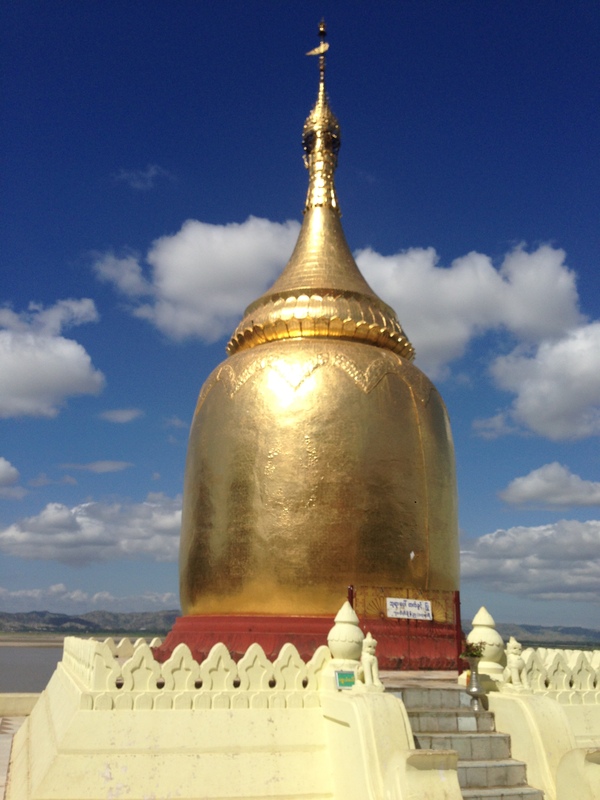 This is one of four such temples in Myanmar…celebrating the replica of the tooth of Buddha and they are all high atop hills and mountains, this one was on Maha Dhammayanthi Hill. Needless to say we did not attend. 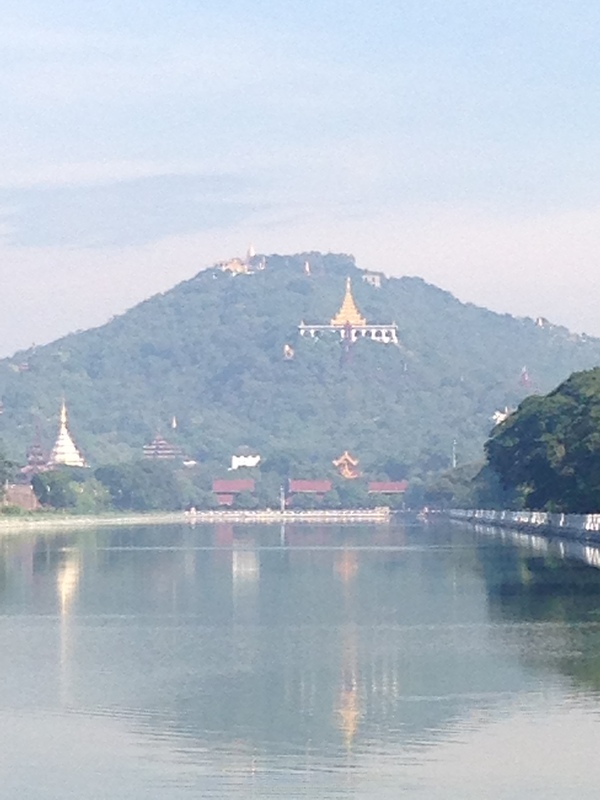 Having seen the palace we headed back the 1k to the east gate and headed north for the 1k walk to the bottom of Mandalay Hill (anyone keeping count of our little amble…god knows I was). From the bottom of the hill we started the climb up the covered staircase (called saungdan). 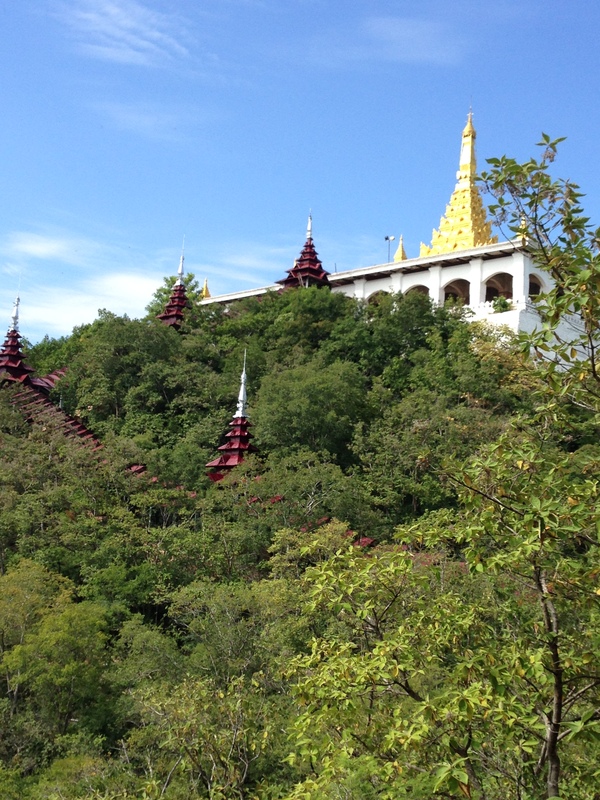 At the top of the hill is the Sutaungpyei (wish-fulfilling) Pagoda. The guide book told us that for those who are fit to make the climb, it is considered a rewarding experience and a meritorious deed at the same time. What it also told us…in fine print…was that it was a holy site so the shoes came off and we did a 45 minute stair climb barefoot. For those that have been following…my darling (mountain goat) bride did the 1200 stairs to get to the Great Wall in Mutyanyu in 15 mins…this climb took 45…admittedly I am certain I slowed her pace…buy hey…just a bit of context here. Did I mention that it was barefoot. Any guesses as to what the local dogs do on the staircase…yep…a new degree of difficulty. Anyway up we went. 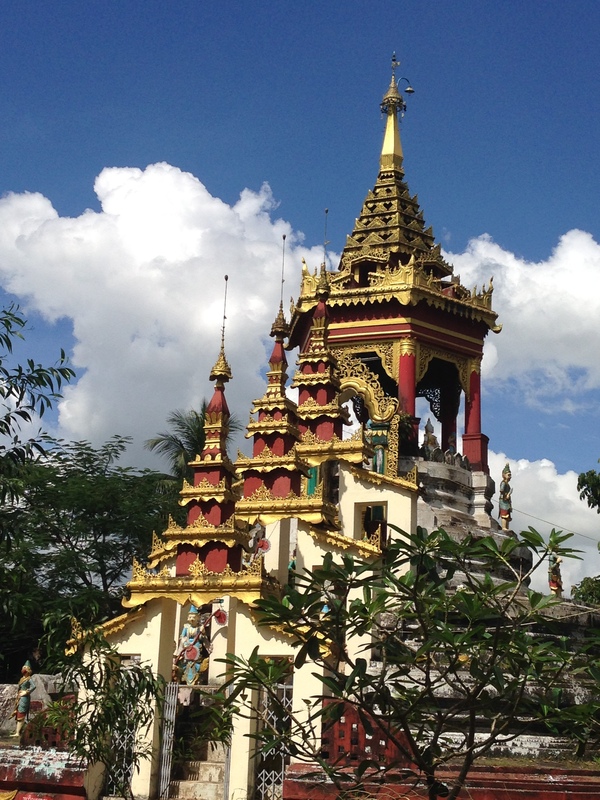 We intermittently hit plateaus with pagodas or temples on them. 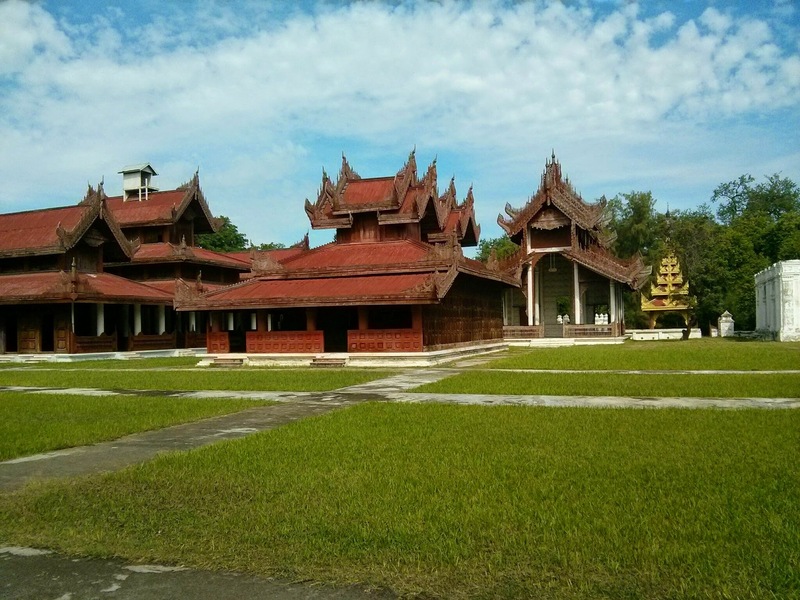 The most impressive was the hermit U Khanti’s dazaung hall. This was about one third of the way up and was spectacular with views over the palace complex and the religious sites below. 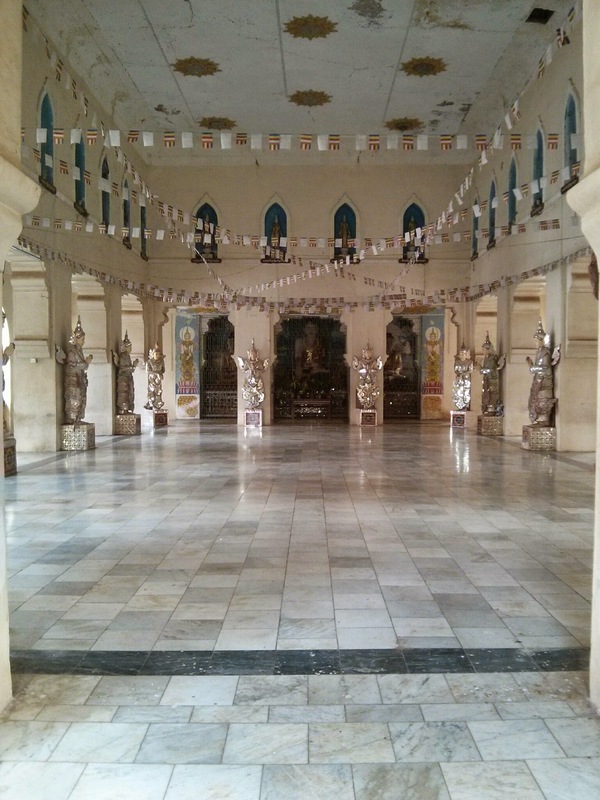 This hall once held three fragments of bone of the Gautama Buddha (a different Buddha to the toothless one) but they were moved in the 1940’s. The stairs went up…so…so did we. We climbed hitting the odd plateau of religious (or commercial) significance. As we neared the top we popped out onto a road as taxis ferried those tourists who were not interested in rewarding experiences or meritorious deeds in 37 degrees and 80+% humidity. We kept climbing and passed some Germans who were looking ragged but un-sweaty who warned us that there were many more steps and there was still a long way to go. On we went…as it turned out there was only about another 200 stairs and they weren’t that tough…these Germans were clearly not doing the meritorious deed. Having reached the top we found that the view from the top was actually considerably worse than the really good one we had 1/3 of the way up. 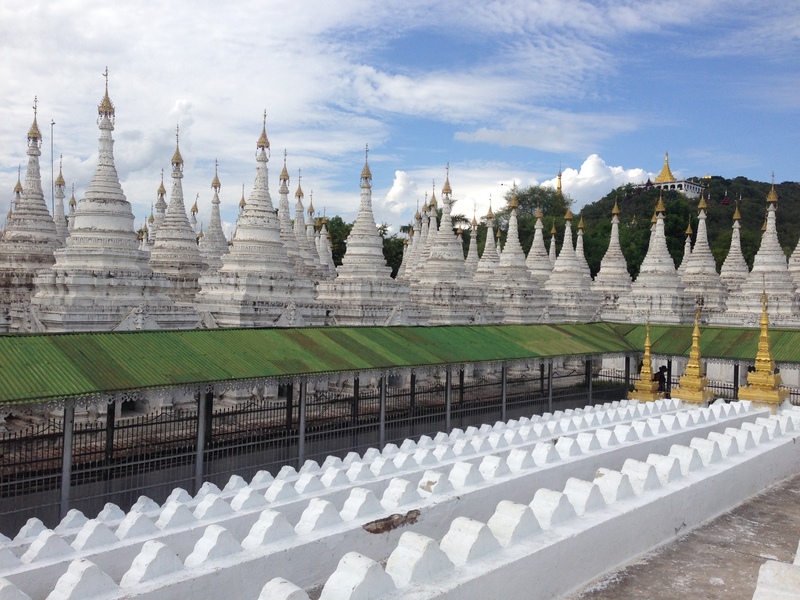 We later learned that the road dropped tourists off at an escalator which in turn had a lift to take you to the pagoda at the summit. Anyway…we took some pictures and headed back down the stairs. 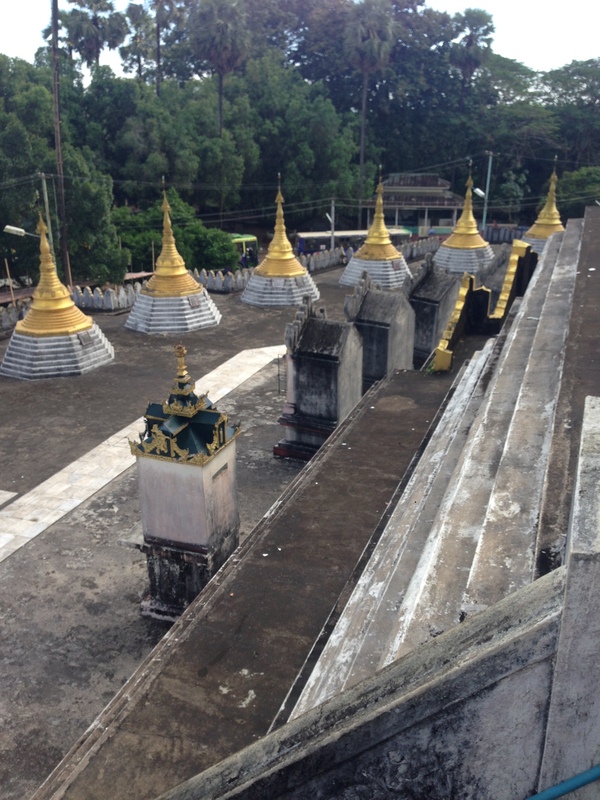 When we hit the U Khanti’s dazaung hall, 1/3 of the way up we saw a shiny gold pagoda surrounded by hundreds of white stupas. 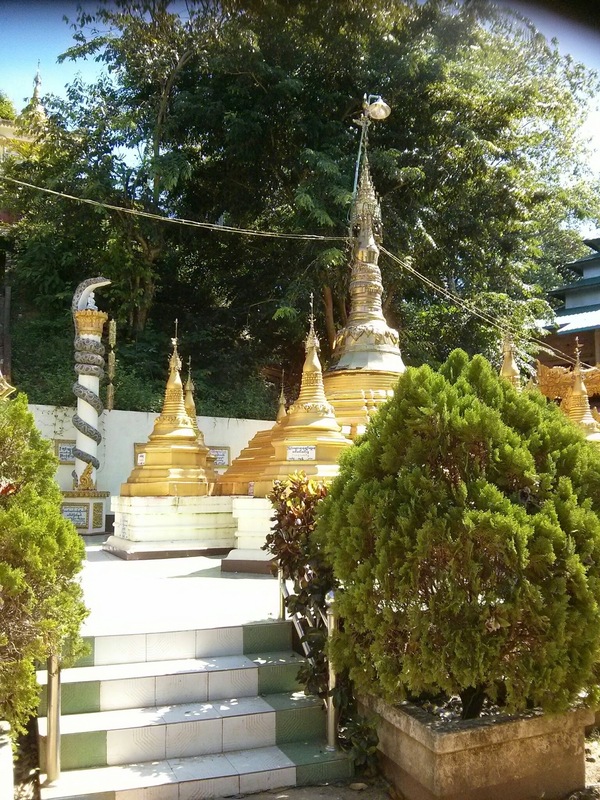 We found at this was the Kuthodaw Pagoda, and would be our first stop upon reaching the bottom of the hill. Upon reaching the bottom we found that this was the site of the worlds largest book. 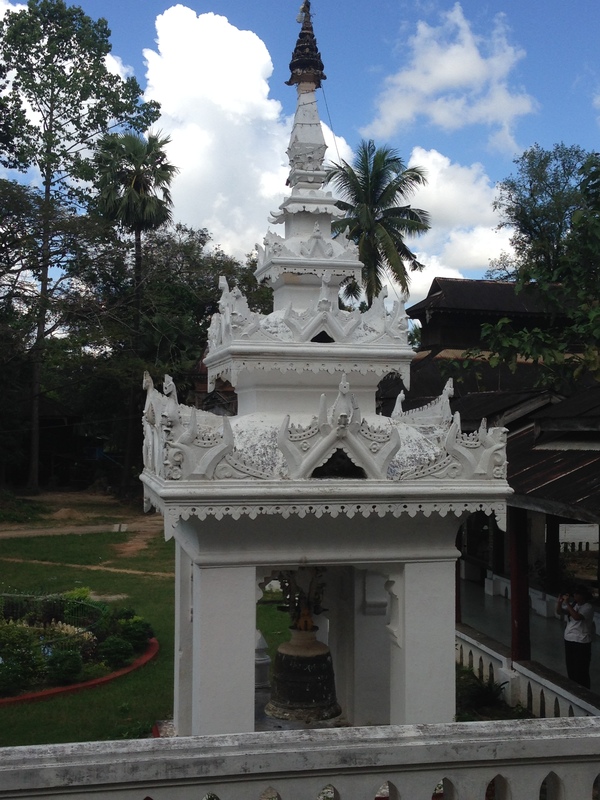 Surrounding the pagoda were 729 kyauksa gu or stone-inscription caves (not the stupas I thought that they were). 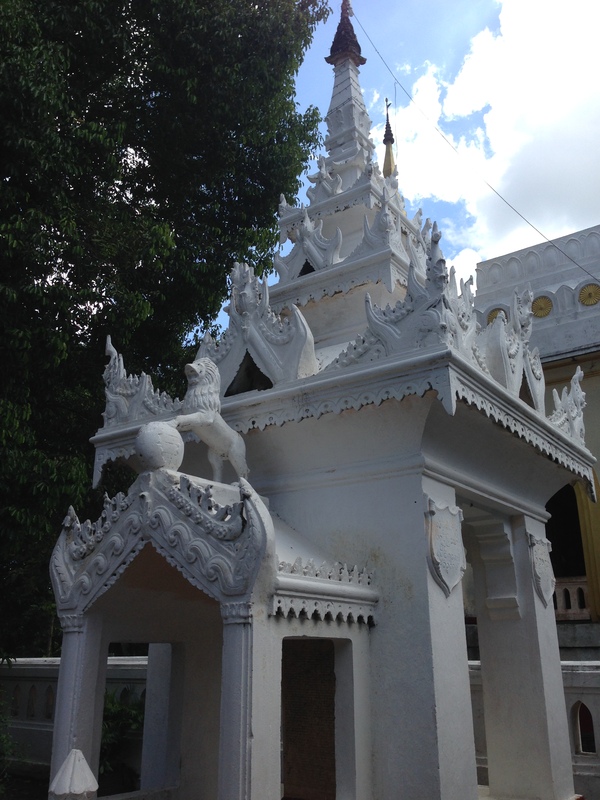 Each of these contained a marble slab that was 5 foot tall, 4 foot wide and was inscribed on both sides with a page of text from the Buddhist holy text…impressive. 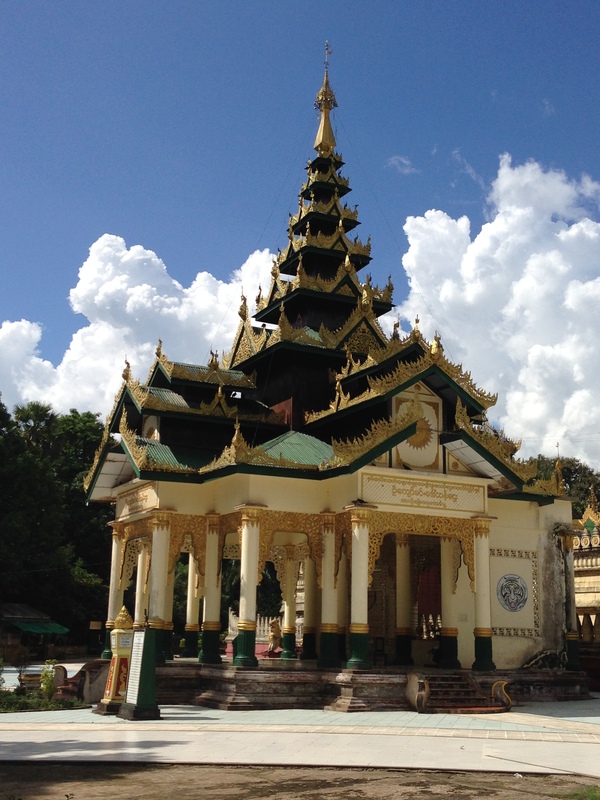 And our Mandalay visit was over…I was tired so we hopped a cab (back of a ute) back to the hotel for a shower and a crash before we woke for a day of killing time waiting for our train ride to take us to the next port of call…Bago. 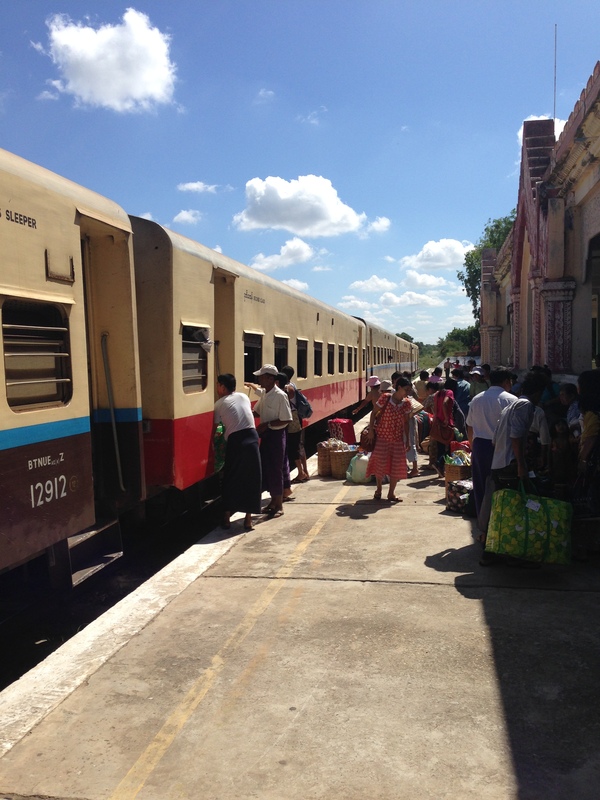 We left Mandalay on yet another train journey…the last train journey I was conflicted but after a second nightmare journey all I can say is NEVER get on a train in Myanmar. It is without a doubt the worst experience that you can have. This one was every bit as bad as the last one but did not have the human interaction to rescue it. Our trip began with using half a can of bug spray to kill the 200+ spiders in our sleeper cabin…and the broom from the toilet to rid ourselves of the multitude of webs etc all over our room. Add to this the jumps, bumps and body wracking bits from before and this was another 15 hrs of hell. We got off the train in Bago in he early hours of the morning to find that English and transport were not as prevalent out in the sticks. We tried to get a cab or a ute or whatever passes for a taxi or transport…we ended up as two fat westerners, with luggage, on pedal trishaws, being driven around by 50kg skinny Asian guys…who had no idea where our hotel was. After a couple of false starts, a rider change for Jill, and me walking up the hill of the bridge cos I was too heavy we got to our hotel. 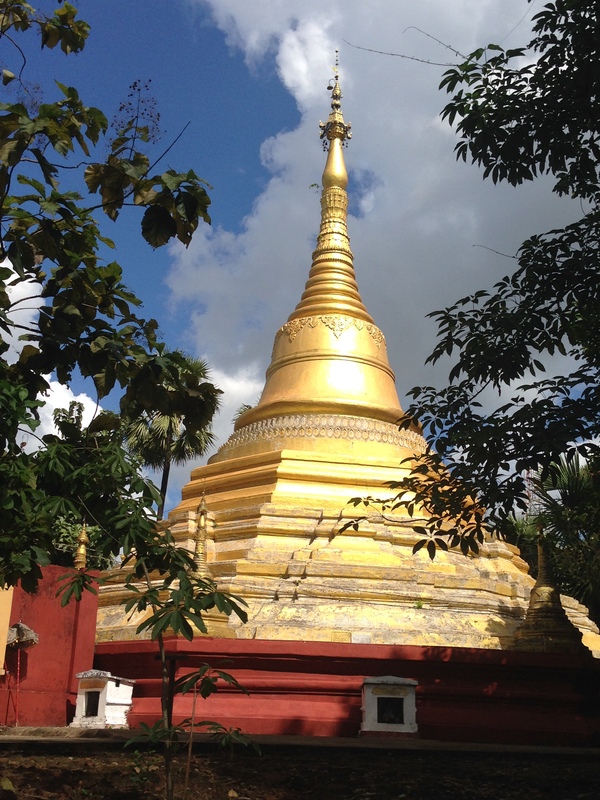 The main reason for coming to Bago was that it was a good launching point to head to the Kyaiktiyo Pagoda more commonly known as the Golden Rock. 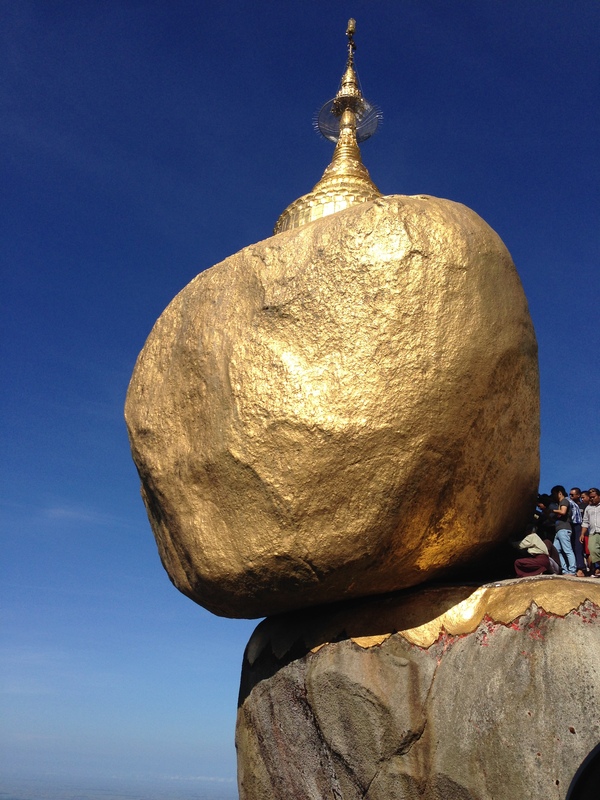 It is pagoda built on the top of a granite rock that has been covered with gold leaves pasted on by visiting male pilgrims…I say male because women are not allowed near the thing. 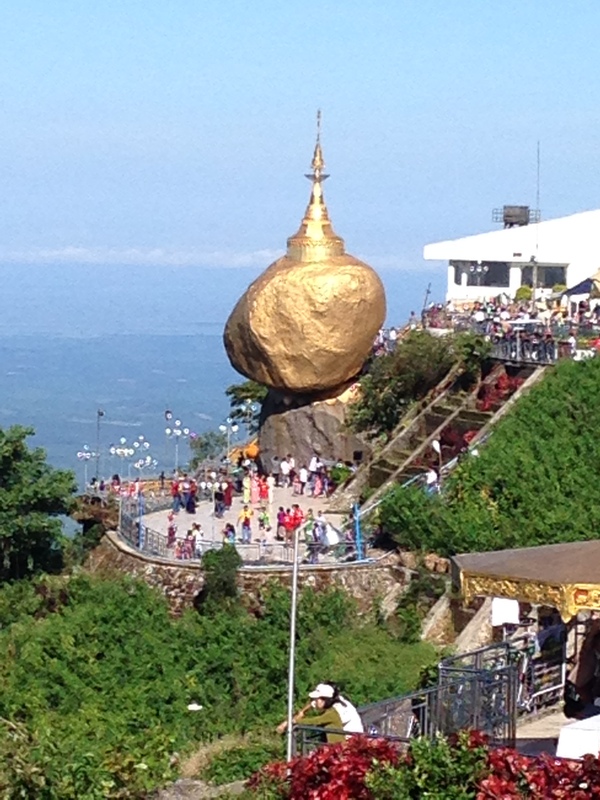 According to the legend, the Golden Rock which is precariously perched on the mountain is held there by a strand of the Buddha’s hair. 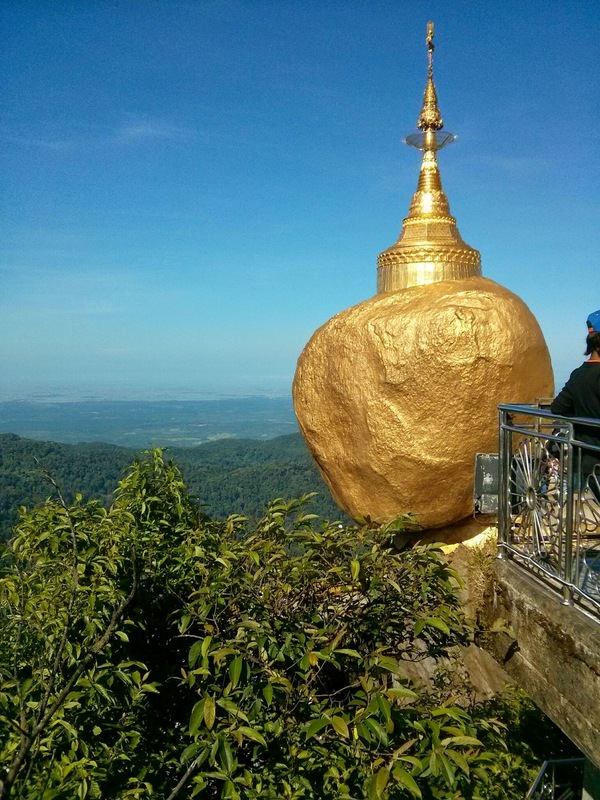 It is said that a glimpse of the “gravity defying” Golden Rock is believed to be enough of an inspiration for any person to turn to Buddhism…I on the other hand had different thoughts. Now to become a Buddha you must reach a level of enlightenment to raise yourself to such a position. 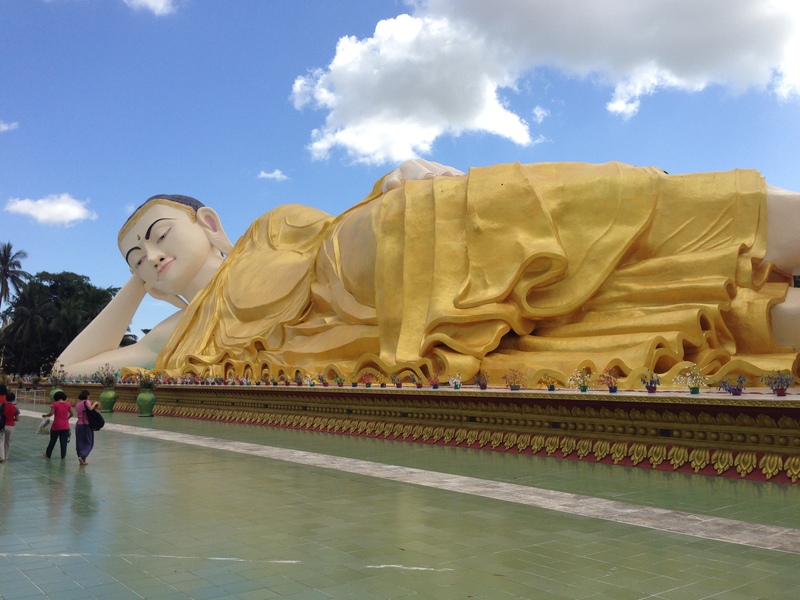 To achieve this the bodhisattva (living future Buddha) an aspirant to the full enlightenment of Buddhahood generally become monks and train themselves, through altruistic deeds and meditative effort, to acquire the qualities essential to a Buddha. 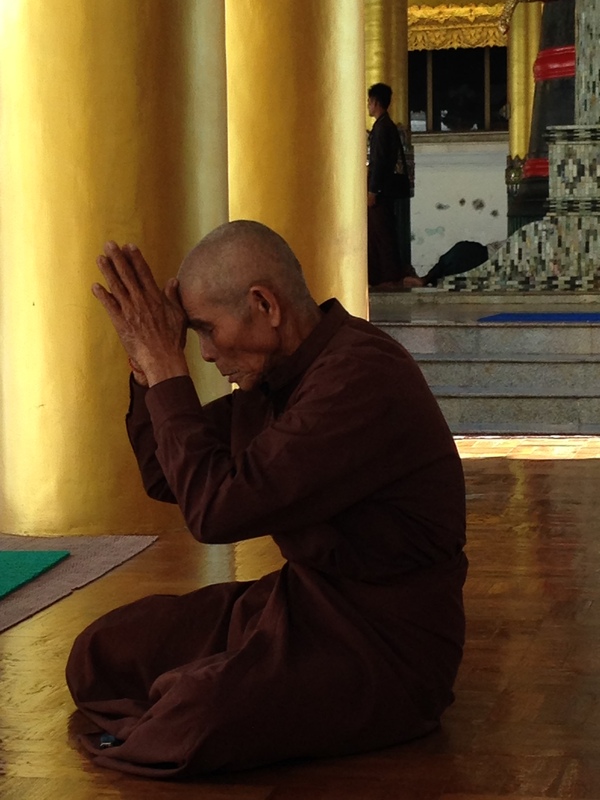 I have seen a lot of these monks…in a lot of countries…they have shaven their heads and are all bald…but the rock is held up by hair…my thought…how curly was this hair. The trip to the rock was entertaining enough initially as we cabbed the 100km to get there passing some stunning rural sights along the way. Upon arrival at Kinpun (the town at the bottom of the hill we were met with our transport to get us to the top of the hill. It was (without word of a lie) a dump truck with rows of seats bolted to the sides which they jammed 6-7 people per row. Five per row would have been relatively comfortable six was silly and seven was just lunacy. Add to this the fact that the rows were so close together that you had to go almost side-saddle to get in and this was less than ideal. 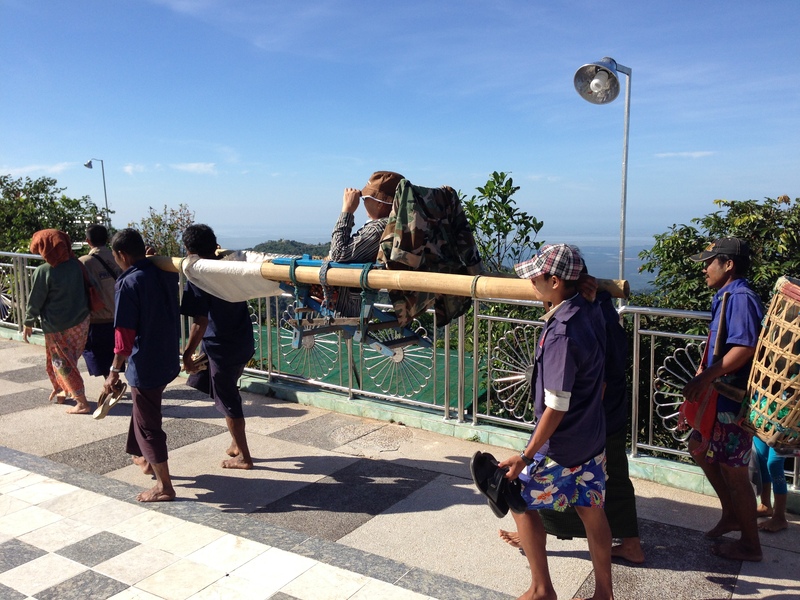 Having reached the top there were dudes with bamboo poles and seats offering to carry me up the stairs to get to the rock.. for a very reasonable fee. Before I could formulate an answer I was clipped across the back of the head and told not to even think about it. 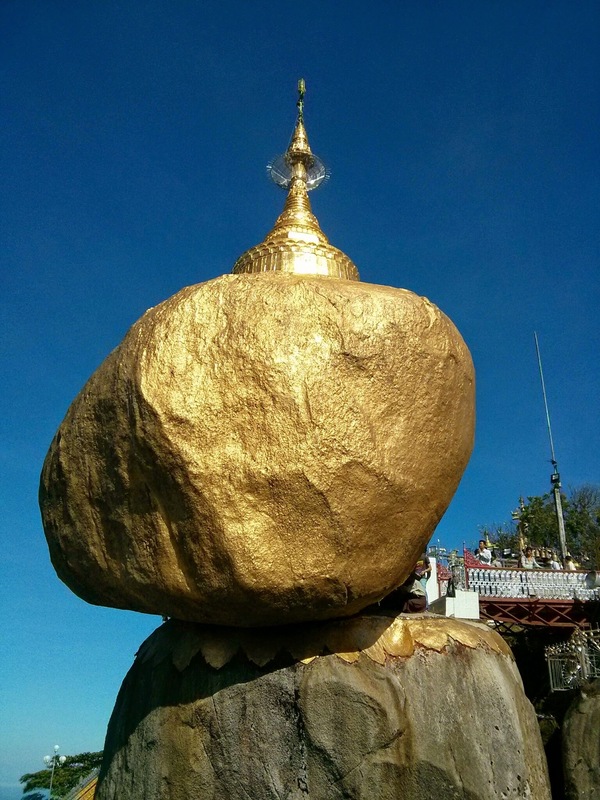 The rock was certainly cool and we headed back to town and had another huge Burmese feast for basically nothing. This was a pattern in this place. 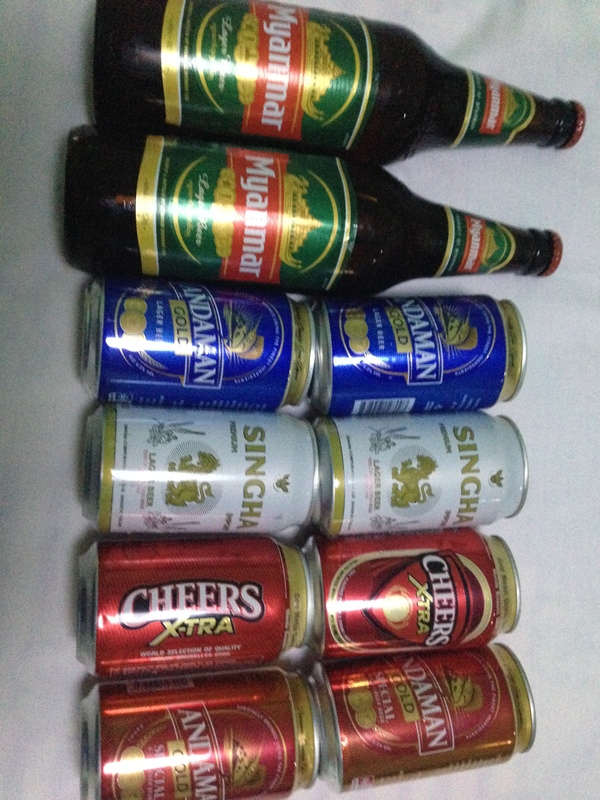 We could go out to dinner and have a huge feed, generally washed down with some Myanmar or Dagon lager and we would get change from $10. 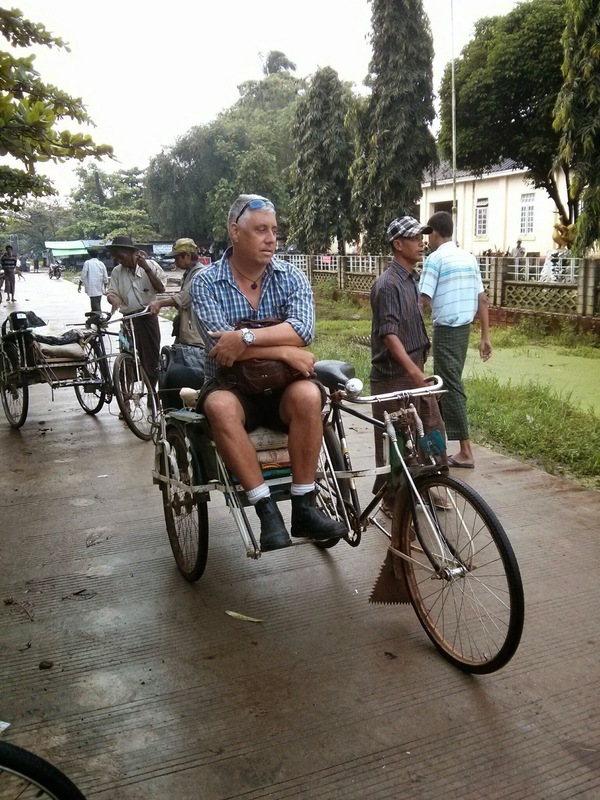 The next day we locked in to see some of the local sights around town with the skinny old dude who pedalled us to the hotel on day one…but in a motorised transport version this time. By motorised transport it was a Burmese version of a tuk tuk with the same level of suspension as that which existed on the train. 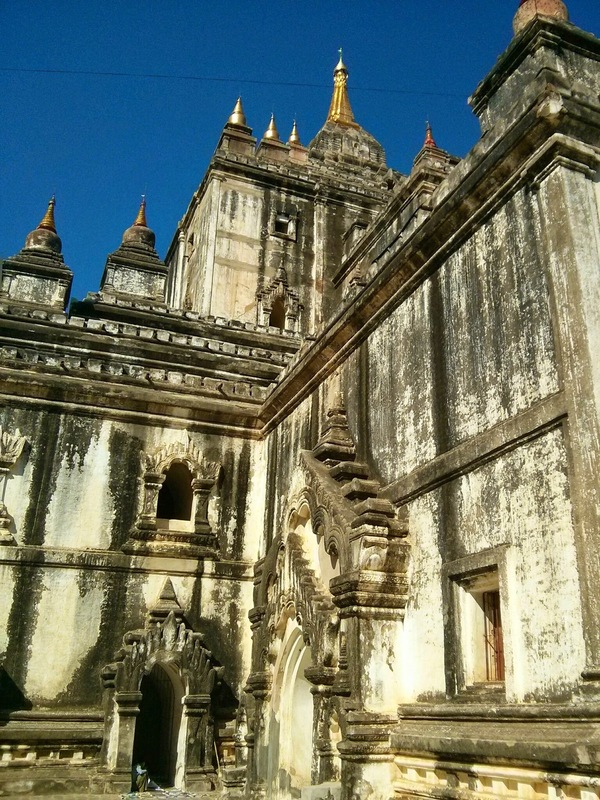 The first stop was the Kyatkhutwine Monastery which houses about 700 monks. We got lucky and arrived at meal time and wandered through the dining hall being amazed by the size of the rice pots. From here we headed into the kitchen and got a sense of what it took to cater for 700 people on a daily basis. From here we headed to the snake temple which in essence is a small temple with a huge snake. 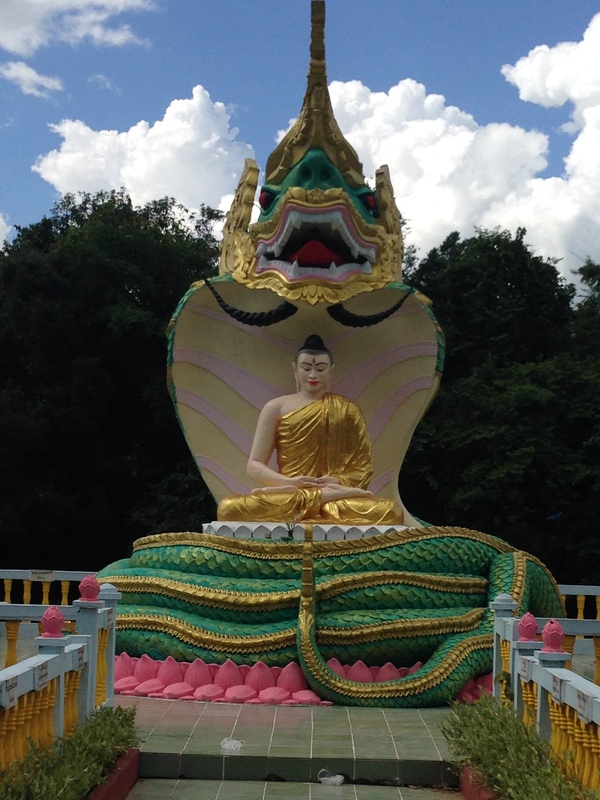 The snake is said to be the 120 year old reincarnation of the former head of a monastery in Hsipaw. 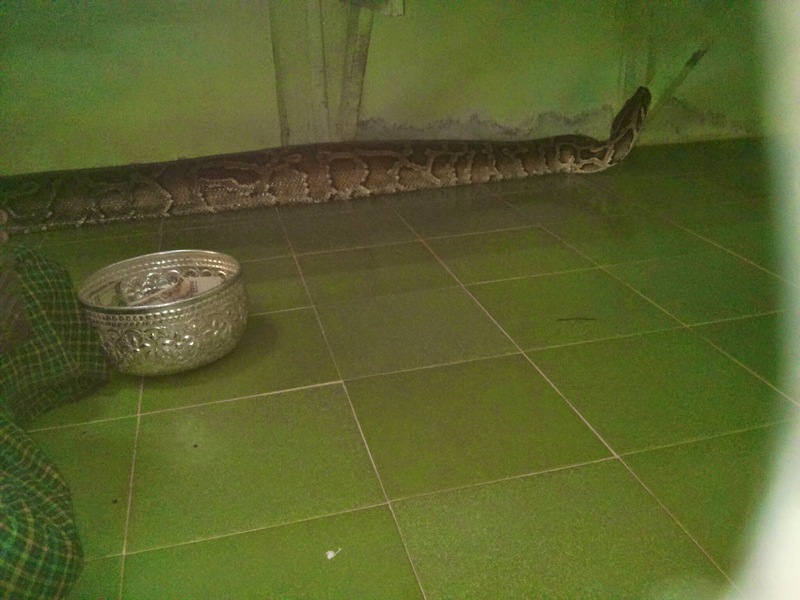 In reality it is a massively over fed 7 metre long python. 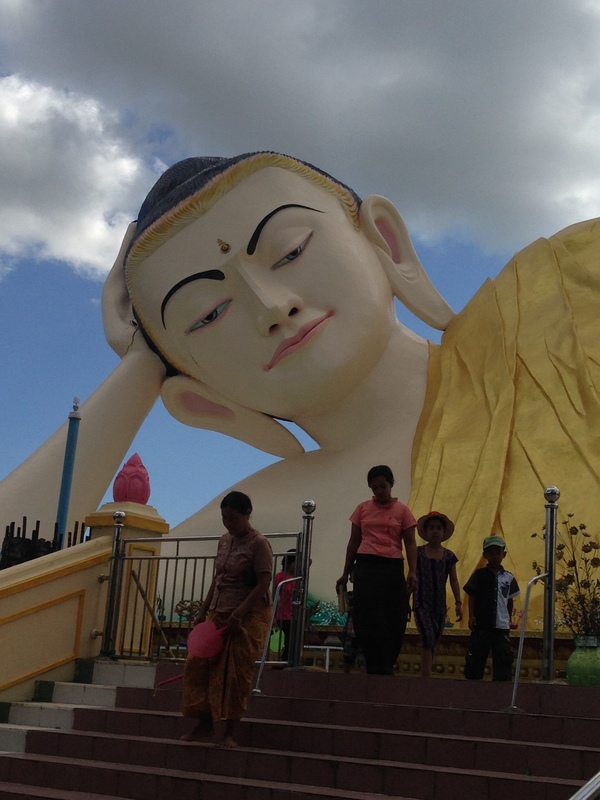 We hopped around to some lesser pagodas and temples then hit the Shwethalyaung Buddha which is the worlds second largest reclining Buddha at 55m long and 16m tall. 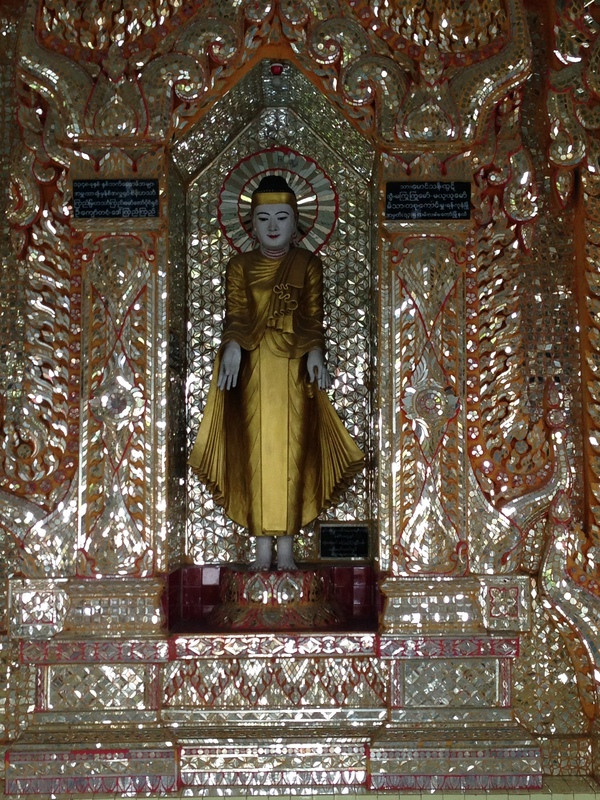 Then on to Kyaik Pun Pagoda the home of the Four Seated Buddha shrine. From here we hid in the hotel during the heat of the day before meeting our dude at 5pm for a trip to the Shwemawdaw Paya pagoda, the tallest pagoda in Burma at 114 metres. We got lucky and were here for a festival that saw thousands of people attending and setting up for the after dark festivities. 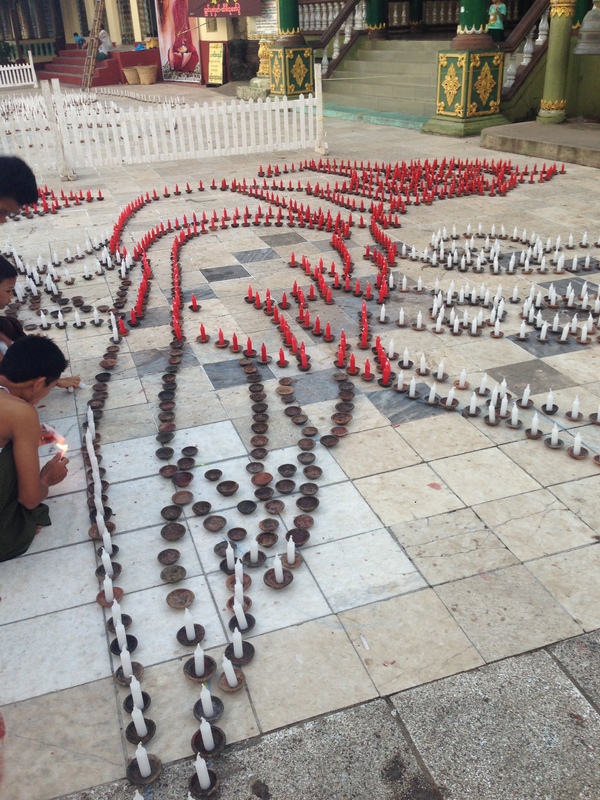 This involved the designing and laying out of tens of thousands of little clay pots into words and images and putting in candles for the nighttime lighting. 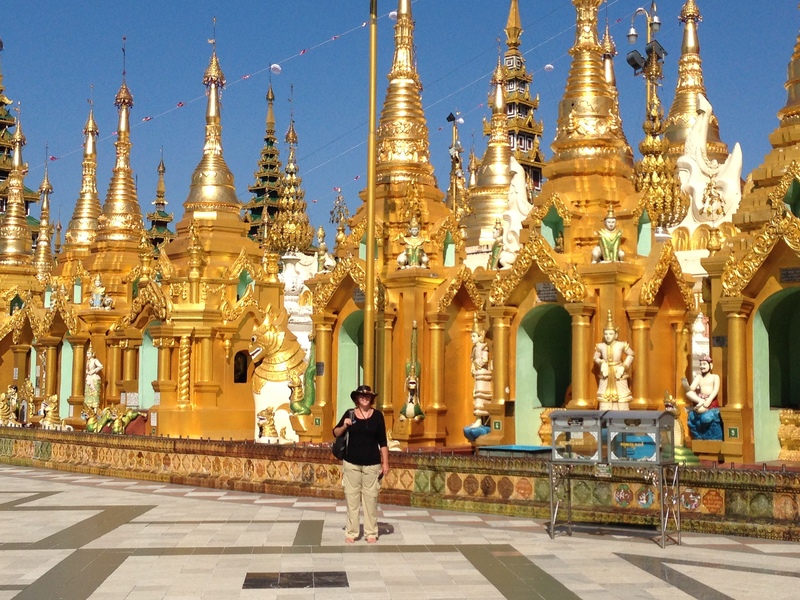 Jill is a bit of a local celebrity here in Myanmar with everyone smiling, grinning and waving at the white woman in the funny hat. I get the hellos and the waves but Jill is by far the star of the show…especially with the kids. At the festival a small boy was on his fathers lap and was excitedly pointing at Jill as if she was a rock star, she noticed and waved which incited a level of excitement rarely seen. 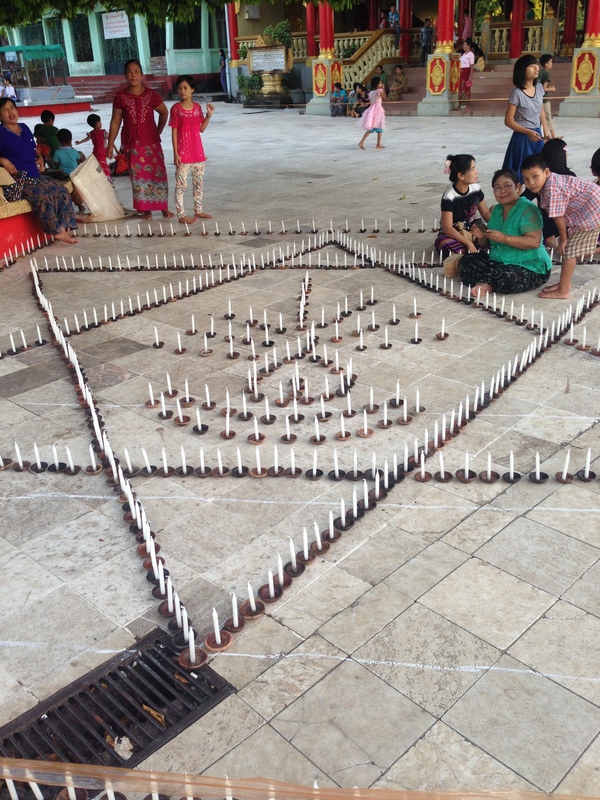 This kept going for about 10 mins as we looked at the pagoda, the candles and the people generally. By the end the small child was blowing kisses to her and nearly fell over when she blew one back. 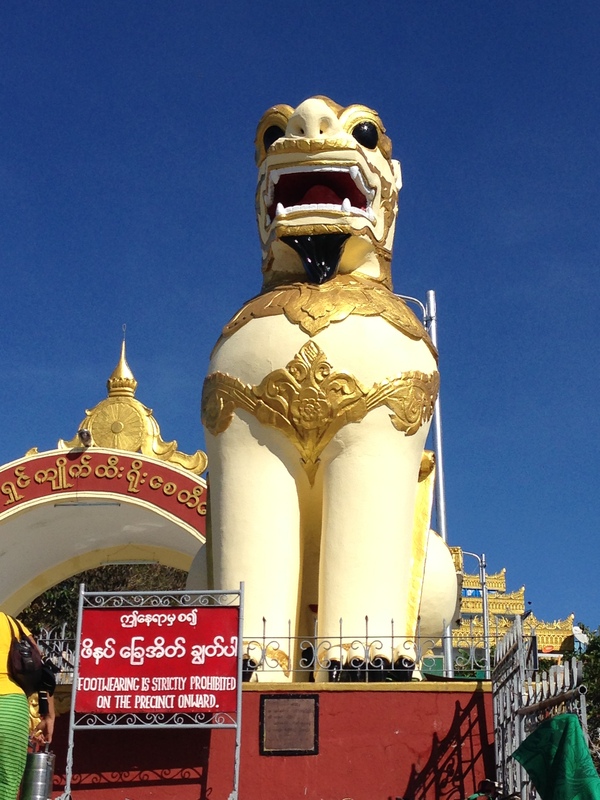 This level of friendliness here in Burma is ubiquitous. The warmth and welcoming that you receive from everyone is something that must be experienced. Let’s hope that this genuine quality does not get replaced by mercenary overtones once the tourism kicks in. 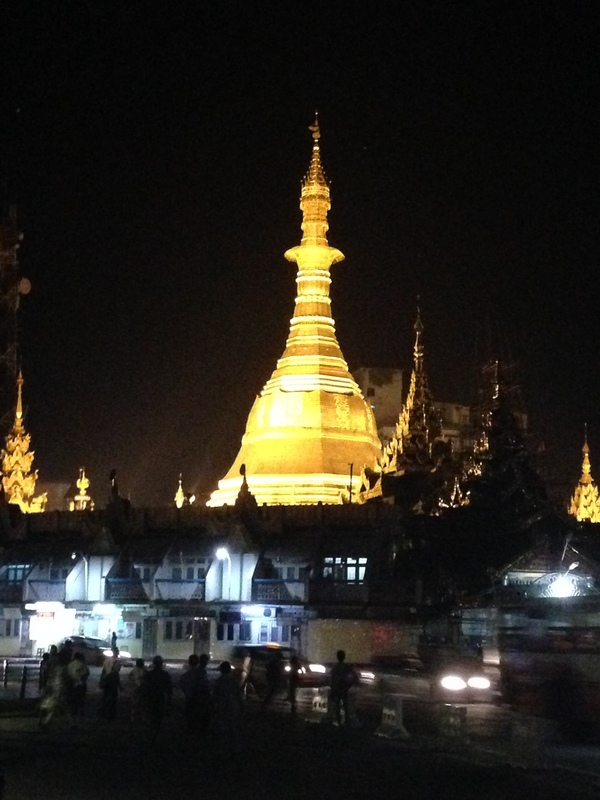 With Bago finished we hopped a cab back to Yangon where we spent a night before saying farewell to Myanmar. 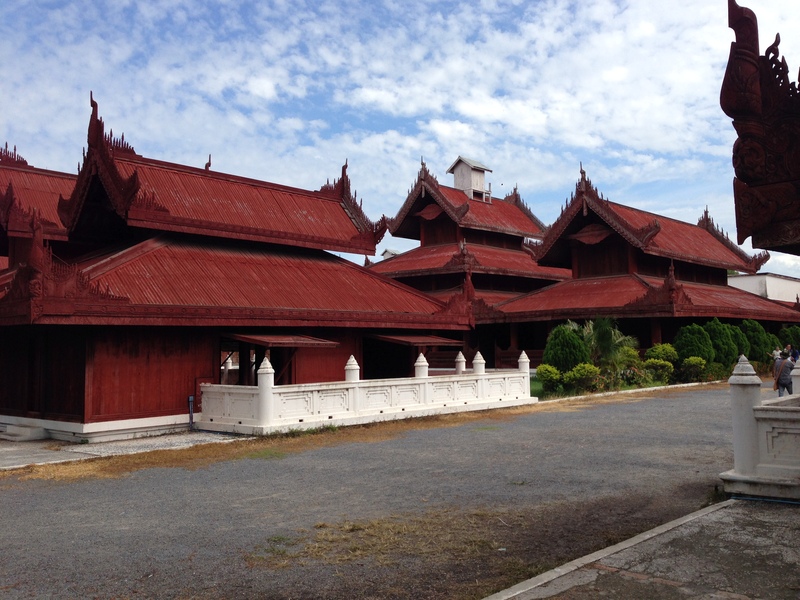 We had a flight to KL where we crashed for a night and then started the next leg of this little adventure…Laos. Sounds like you had a great time, you’re ‘story telling’ is very honest and interesting! 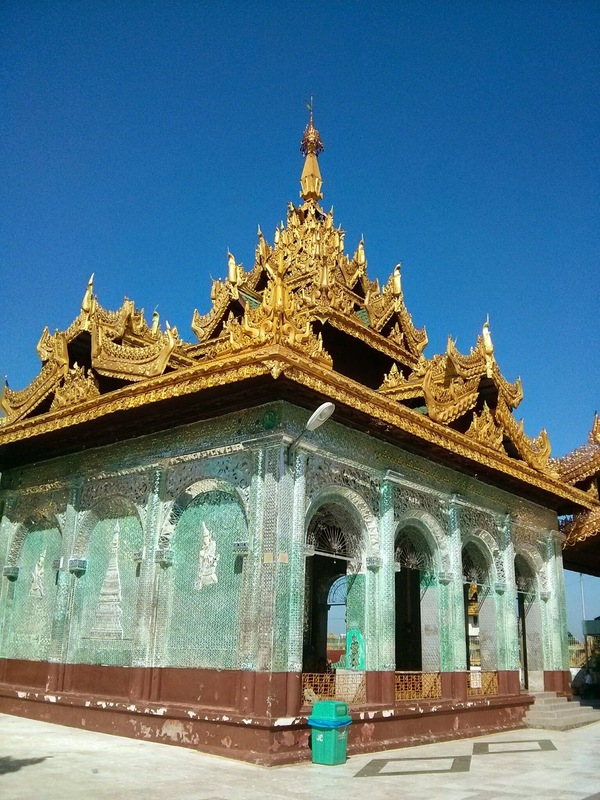 Ive just spent the month of September there – did a Pandaw boat trip down the Chindwin River – it was unbelievable – I have done the Road to Mandalay boat Bagan to Mandalay – I was warned off travelling by train. 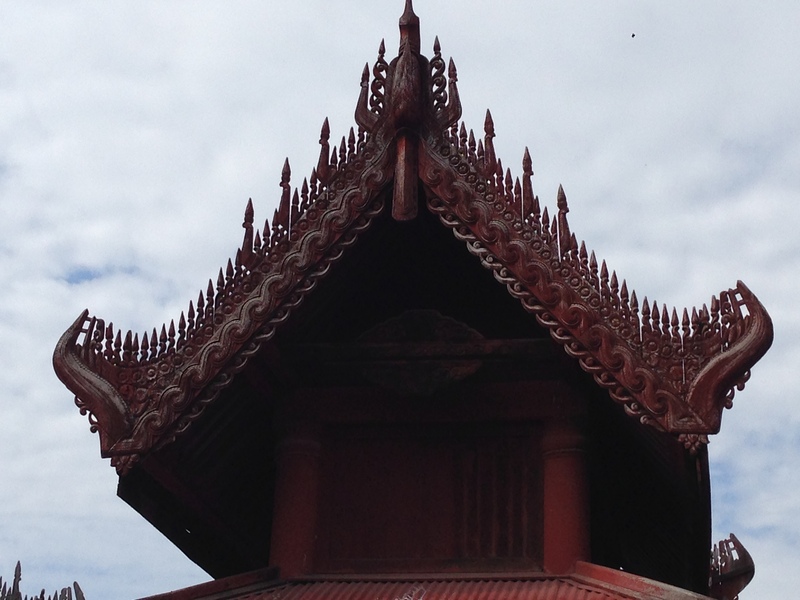 Spent 5 days at Inle Lake and will go back there again for longer period. 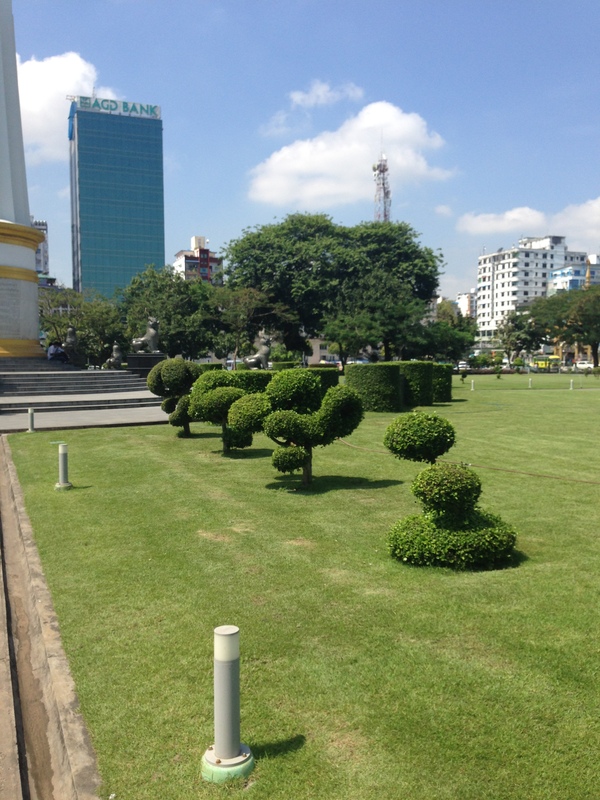 I have the most wonderful Travel Agent in Rangoon who is the best – would be happy to share with anyone. 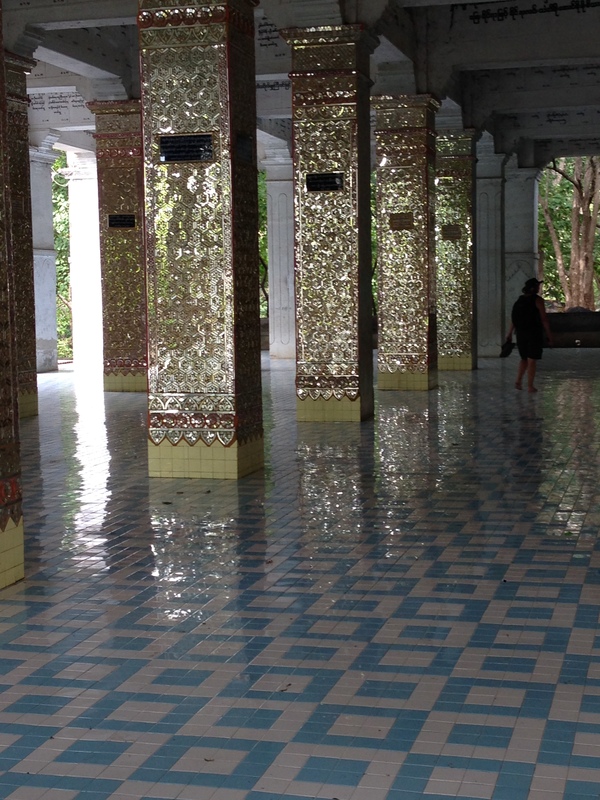 Went down to Moulmein (sorry I do not use the new names ) definitely worth a trip down there.